Italian autonomist Sergio Bologna discusses the rise of Nazism and its relationship to the German working class. A meeting like this doesn't just happen by chance. We have received assistance from a number of organisations. For example, the Micheletti Foundation (to be specific, Pier Paolo Poggio) has researched the available literature in English, American and French journals; the research institutes in Hamburg and Bremen have made available original research work and a selected bibliography; and Michael Wildt, editor of Werkstatt Geschichte undertook to study the journal published for history teachers in junior and secondary schools in Germany, Geschichte im Unterricht. We wanted to see whether the teachers' association has, in recent years, addressed itself to the relationship between Nazism and the working class, whether the subject has been discussed in their journal, and whether we might find useful bibliographical references. As it happens, in the past six years the topic has not even been broached. Such a lack of interest strikes me as bizarre, given that recent events in Germany's political and social life have brought to the fore the problem of the influence of extreme Right-wing and neo-Nazi ideas and forms of behaviour within the working class, among skilled workers, apprentices and irregularly-employed youth. On the other hand, in a disturbing development, over the past decade various historians have focused increasingly on what they say was the decisive contribution of sections of the working class to the Nazis' electoral victories, and they have also documented a massive presence of the working class within the social composition comprising the electoral base of the Nazi Party. In this area we are witnessing a crescendo of contributions. Already by the early 1980s work was being done on analysing election results from the 1930s. This work has been continually updated and enriched, and has now arrived at the following conclusion: the percentage of votes for the Nazi party deriving from the working class showed a continual upswing in the period preceding the Nazis' seizure of power. Jurgen Falter is one of the historians who has researched the phenomenon in depth, and he presented his initial results in 1986 in the journal of the Friedrich Ebert Foundation, an organisation close to the Social Democratic Party. In his most recent article, published at the start of this year (in the journal Geschichte und Gesellschaft), Falter previews the results of his research project carried out on 42,000 Nazi party membership cards, from which it appears that the party's working-class membership stood at more than 40 per cent. What we find developing here is an interpretation of Nazism as a phenomenon within which the working-class component is strongly present, if not decisive. This flies in the face of the traditional interpretation, which sees the Nazi party essentially as the party of the Mittelstand, in other words of the middle classes. This is one aspect of the problem. In my opinion there is an even more important consideration. Namely: since the fall of the Berlin Wall, a number of articles and books have appeared in Germany, published with remarkable editorial efficiency, all tending to demonstrate not only that the working-class component was decisive within Nazism before Hitler's taking of power, but also that, after taking power, the policies pursued by the Nazi regime were actively favourable to the working class and tended to bring its social status closer in line with that of the middle classes, along tendentially egalitarian lines, thus making Hitler a true "social-revolutionary" of the twentieth century. A key work in this revisionist strand is Rainer Zitelman's book Hitler, Selbstverstandnis eines Revolutionars (published in Italian translation by Laterza in 1990). Before dealing with his theses, it is worth pointing out that about ninety per cent of the literature on the relationship between the working class and Nazism in Germany does not accept this interpretation. However our publishing industry chooses to ignore this fact, and is happy to promote books that are launched by the media, particularly if they present a challenge to accepted historical interpretations. Given that the Italian Left also tends to follow cultural fashions, it has become a kind of echo chamber for this historiographical revisionism. Zitelman's text is pretty insubstantial, given that it consists of a compilation of quotations from Hitler's speeches and writings, unaccompanied by any research into archive sources. The basic thesis is that Hitler was a true working-class leader who had a real interest in the betterment of the working class; he set in motion highly advanced social policies, and specifically a policy which used the instrument of the indirect wage to produce equalising tendencies within the structure of German society. All this, as I say, is based not on a close examination of the facts, but on Hitler's offical statements, writings and speeches. I would say that here we are dealing with a kind of historiography which is tendentially new, compared with the historiography around which the issue of the so-called Historikerstreit developed. This latter involved a dispute around the nature of Nazism and the problem of the guilt of the German people, prompted by the publication of the work of Ernst Nolte. The controversy began in 1986, but by 1989 it had run its course, partly because the polemic had run out of steam, but also because in that year the fall of the Berlin Wall opened a whole new series of contradictions and cultural problematics which were inevitably also reflected within historiography. The new polemic to which I am referring has not yet arrived in Italy, but I expect that it soon will. It would be sensible not to let ourselves be taken by surprise. In order to avoid being thrown onto the defensive by this new revisionism, we need to react in advance, in order to clarify publicly the terms of this new debate. The fall of the Berlin Wall, as well as creating new contradictions, made available a large amount of new historical material - sources from the ex-German Democratic Republic, which were particularly rich in material covering industrial and economic issues in Germany during the Nazi period. This source material is invaluable for a reconstruction of the context of working-class life and work under Nazism. In addition, in West Germany, as from the early 1980s a number of major industrial companies opened their archives, not only to company historians, but to outsiders too. The Daimler Benz company provides a good example of this development. In 1987, two research projects were published virtually simultaneously. The first was put together by a group of researchers whose principal concern was to present a good image of the company; the second was able to highlight Daimler Benz's grave responsibilities in the preparation of the Nazi war machine, and in the use of forced labour. This second text, the Daimler Benz-Buch, prepared by our Foundation (principally by Karl-Heinz Roth) was widely read (a new and updated edition is about to be published by the 2001 publishing house). Its importance was that it opened a breach in the wall of silence on the subject of forced labour under Nazism, to which I shall return below. Among other things it forced Daimler Benz to admit publicly the silences and contradictory claims of its "official" historians, and, for reasons of image, to shell out the not inconsiderable sum of 20 million marks as financial compensation for surviving forced labourers and their families. The fall of the Berlin Wall and the events that surrounded it produced a major upheaval in the structures of historical research in ex-East Germany, and set in motion a process of self-criticism among various leading East German historians, in particular over how they had handled the problem of relations between the working class and Nazism. In short, with the fall of the Wall, a sound basis was laid for continuing detailed research work and examination of the documents and archives of the Nazi period. This has subsequently led to a vigorous publishing activity. The effect of two decades of this work has produced results which the machinery of revisionism will be incapable of eradicating. My intention in drawing your attention to all this research is to enable you to judge for yourselves the baselessness and intellectual dishonesty of the new voices of historical revisionism, and the profound ignorance of those who choose to publish and promote their books. An early example of this research is an article by Ulrich Herbert, director of the Centre for Studies of the Nazi Period, in Hamburg. This was published in the journal Geschichte und Gesellschaft in 1979, under the title "Workers and National Socialism. A historical assessment. Some unresolved questions". Ulrich Herbert is a well-known historian, particularly known in Italy because of his work on an overlooked corner of historical research - the use of foreign labour-power within the German war economy from 1938 onwards. As I said above, the question of forced labour was also one of the main points of the research carried out by Karl Heinz Roth on the history of the Daimler Benz company, and it has been the subject of work done recently by Italian historians. Unfortunately not many Italians choose to research the social history of Nazism. For this reason it is worth mentioning two important recent works by Italians - the study by Gustavo Corni entitled "The agrarian policies of National Socialism, 1930-1939", and Brunello Mantelli's piece entitled "Camerati del Lavoro", on the use of Italian forced labour within the German war economy. Mantelli's studies have been proceeding in parallel with a study by our own Foundation, on the transfer of Italian workers to Nazi Germany, an oral-history project which has been largely in the hands of Cesare Bermani. Bermani's work has opened new understandings of everyday life in Nazi Germany on the basis of a little-studied episode in relations between the Third Reich and the fascist government in Italy: the handing over of some half a million workers in return for supplies of fuel. This was an anomalous episode in the history of Italian emigration. Before the Second World War, emigration was spontaneous and uncontrolled, whereas in the case studied by Bermani and Mantelli the exchange of labour power was formally contracted between two nation states. As I was saying, progressive German historiography has given us a useful view of the years of the war economy - namely that the composition of the workforce was multinational, the ethnic stratification was extremely rigid, and 80 per cent of this workforce was working under conditions of forced labour. This element of forced labour has been one of the new areas of research which has been pursued during the past decade not only by our Foundation, but also by other researchers, and it provides a fundamental basis for understanding the relations between Nazism and the working class. A crucial work in the history of relations between Nazism and the working class is the book by Timothy W. Mason, Arbeiterklasse und Volksgemeinschaft ("Working Class and the 'National Community'" [published in English as Social Policy in the Third Reich, Berg, Providence and Oxford, 1993]), which revolutionised our view of working-class behaviour under Nazism. Halfway through the 1970s, and in opposition to all previous positions, he used unpublished documentation to show that, in Nazi Germany, in the period from 1936-37 onwards, in particular among the working class, and not only in the factories, there was a passive resistance, which often became active, and that there were also strikes, to which the regime was forced to respond with repressive measures. Mason thus completely overturned the dominant view which claims that there was no resistance to the Nazi regime from within the working class except during the first few months of its rise. Mason's thesis is supported by a wealth of documentation. The book (1,300 pages long) was published in 1975. More than three quarters of it consists of documents. The only part to have been translated into Italian was the Introduction, which was published by De Donato in 1980, under the title La Politica Sociale del Terzo Reich, a book which unfortunately disappeared from circulation when its publisher went bankrupt. As from that moment, all historical research had to take account of Mason's work. On the one hand it produced further studies along similar lines, and on the other it created fierce opposition. The new wave of historical revisionism tends to dismiss Mason's work and documentation out of hand. Mason's great merit, leaving aside his observations on the subjective behaviour of German workers, was that of redefining the historiography of Nazism, which, in Germany in particular, at least until the mid-1970s, had only once shown signs of life, in the debate sparked by the great Hamburg historian Fritz Fischer. For the rest, Western historiography continued churning out books on Nazism as a totalitarian model, following the canons of an institutional historiography which was completely blind to phenomena in the society at large. Although Fischer also belonged to this school, his merit was to have posed the problem of the "continuity of elites" in German history, a continuity which carried on uninterrupted in the transition from the Wilhelmian period to Weimar, and from Weimar to the Nazi period: the continuity of the power groups, particularly in the field of economic power, had the effect of diminishing the effects of institutional changes. Broadly speaking, the transition from monarchy to republic, and then from republic to dictatorship, were changes of facade, while real power remained firmly in the hands of the same groups as previously. Many historians polemicised against this interpretation. One of the protagonists - and this brings us to our own area of interest - was a historian who is seen as one of the founders of social history in Germany, Jurgen Kocka. The social historians counterposed to Fischer's line of argument a conception of social dynamics based on an analysis of class relations and on the emergence of forms such as the socialist mass parties. This conception was in opposition to what they saw as Fischer's "immobilist" vision, trapped within analysis of the power elites. On the other hand, for Karl Heinz Roth and for the work of our Hamburg Foundation, Fischer's thesis has provided a fundamental interpretational tool. The historical debates that followed on this were not particularly to do with Nazism, but they had important consequences in the historiography of the Nazi period, in particular the controversy among the social historians themselves. This divided the current headed by Jurgen Kocka from the "young" historians who, arising out of the movements of 1968, gave greater importance to a "history of the everyday" (Alltagsgeschichte), breaking down the divisions between the personal and the political. This tendency distanced itself from a social history which had tended to work within the classic schema of working class = trade union. In the course of the debate, different conceptions of the "working class" were to emerge. For Kocka and his school, the working class means waged labour; for historians of the everyday, the monolithic concept of working class is sterile, because in their opinion the historian's job is to analyse all the divisions and differentiations within society, and in particular to analyse all aspects of everyday life, even where they are not principally defined by work or by work relations. This debate has very important implications at the level of relations between the working class and Nazism. Why? If we adopt a monolithic concept of the working class, inevitably our judgement on its behaviour in relation to the Nazi regime will end up being schematic - either for or against, either opposition or submission - whereas if we use the more highly differentiated concept of stratified class composition and analyse everyday behaviours as "political" behaviours, this gives us a more diversified space within which to judge the attitude of the German people as a whole, and of the proletariat in particular. It enables us to reach more articulated conclusions. Furthermore, Kocka's conception, which is similar to that of many Italian historians close to the ex-Italian Communist Party, assigns a central role to the organisations of the labour movement - the political party and the trade union - in the history of the working class and of working-class mentality. They tend to assume an identity between the class and the party, whereas the historians of the everyday tend to highlight the "autonomy" of the working class from the party and from party ideology, a possible "distance" that separates the culture (or rather cultures) of the various working-class and proletarian groups from the culture of the party and union. Among the principal exponents of the "historians of the everyday" we might cite Alf Ludtke and Lutz Niethammer - the latter being the author of a recently published book Die volkseigene Erfahrung, which attempts to understand, via a series of interviews, the subjective view which the citizens of the ex-DDR had of the communist system of power. When historians of the Kocka tendency come to deal with Nazism, they generally view the behaviour of the working class negatively, and therefore consider Tim Mason's work as exaggerated in its claims. The Alltagshistoriker, on the other hand, see Mason as an important reference point. Arising out of his treatment of the social history of everyday life, the end of the 1970s saw a new movement emerging in Germany - that of the Geschichtswerkstatten or "History Workshops". As elsewhere, this was a movement of non-professional "grass roots" historians, but more importantly it can also be seen as part of the movement of Burgerinitiativen, of the civil rights movement, insofar as it defended the right of local communities to know and understand their own pasts. It played an important role in preventing the distancing and the demonisation of Germany's Nazi past, and thus also made possible a reconstruction of the history of the working class and proletariat, insofar as its concern was more with the "history of the forgotten ones" than with the history of Great Protagonists. This was one of the aspects of the neue soziale Bewegungen (the "new social movements") in the 1980s. This overall movement, which reached its height in the period 1983-4, today finds expression in two journals: Geschichtswerkstatt and Werkstatt Geschichte. One of the controversies between the social historians and the "historians of the everyday" hinges on the definition of "culture": the social historians accuse the historians of the everyday of replacing the idea of "class" - in other words of a social formation defined by a set of material conditions that are quantitatively verifiable - with an idea of "culture" as an ensemble of subjective and "non-material" elements which tend to dissolve any "class" identity. The historians of the everyday, on the other hand, accuse the social historians of wanting to limit the identificational criteria of a social class to quantifiable elements, and of advancing party and trade-union ideology as the only element of collective working-class culture. Alongside this debate there also developed a debate on the use of oral sources. While these methodological disputes were important in the sense that they helped lay the basis for a new phase of studies on the relationship between the working class and Nazism, what was more interesting was the results obtained at the concrete level of researching documents, connections and memories. A couple of major oral history projects were carried out in individual regions, in an attempt to gain a better understanding of the behaviour of German people under Nazism; Lutz Niethammer's study on the Ruhr focused on relations between the working class and Nazism in an industrial region, while Martin Broszat's study on Bavaria dealt with a principally agricultural region where Nazism enjoyed its earliest successes. These two were followed by many other studies which focussed on a given region, a city, a village, a factory, a neighbourhood, or even a group of friends. So, we have a project of diffuse local research which in part confirms Mason's theses and in part highlights the ambivalence of working-class attitudes and behaviour. As I say, one of the controversies was over the problem of culture, and the contradiction between the culture of working-class communities and the culture of political parties and trade unions. The historians of the "everyday" tendency maintain that working-class culture is a culture which is created in specific environments (neighbourhoods, factories, local communities), and is thus a gruppenspezifisch (group-specific) culture, of limited social nuclei which live in a community or milieu of their own; it is, if you like, a sub-culture, and thus the history of the working class is to be seen as a history of interconnecting sub-cultures. Secondly, the history of the working class is to be analysed in all the various fragmentations and segmentations which the working class has experienced; one should not limit oneself, as so often happens in the work of social and labour-movement historians, to examining only the central portion of the factory working class that is tied culturally to the social democratic party and the social democratic trade union. This historiographical innovation had the merit of mounting a radical criticism of the concept of culture, and of the way that it was used by social democracy. Some of these researches have maintained that the culture of the party and its functionaries was seen as alien by the rank and file. Apparently they termed it Wissensozialismus, the socialism of abstract knowledge; these historians say that the history of culture has to be examined in the mental attitudes of the working class at this mass level too, because the fracture between high culture and low culture, between rank and file culture and the culture of party functionaries, becomes very strong in certain historical periods. One may or may not agree with these theses, but from a heuristic point of view they were strongly innovative and set in motion a series of fruitful research projects aimed at establishing a relationship between historical memory and the new generations of Germany's citizens, without the filtering mediation of ivory-tower academics or party apparatchiks. This gave us a historiography which identifies the localities where things took place, uncovers the historical remains, and restores to specific locations - to cities that were devastated by war, razed to the ground, and then rebuilt - the memory of their past, particularly the memory of their past under Nazism. Here, for example, we had many initiatives in the area of Gedenkstatte - of places where one could meditate on the recent past (for example, uncovering the traces of concentration camps or some of the smaller forced-labour camps) - and also many initiatives aimed at gathering the memories of communities that had subsequently been dispersed, be they neighbourhoods, factories, or villages. After the devastation of World War II, which resulted in internal migrations and emigrations, other migratory movements were then sparked by the division of Germany into two separate states, and the return of territory of the ex-Third Reich to neighbouring countries such as Poland, Russia and Czechoslovakia, which caused further movements of populations; then there were the great waves of immigrant workers coming from southern Europe, the Balkans and Turkey, resulting in a continuous redesign of localities. The fact of preserving traces of the past and constructing around them an initiative based on historical memory - not simply the setting up of a memorial stone - ranks high in the scale of civil activity and meaning. What does it mean? It means that, whether we like it or not, history has a political function. And, as it says in the title of a recently published collection of historical essays, Geschichte als demokratische Auftrag ("History as a democratic undertaking"), the preservation and elaboration of memory should be one of the commitments of democracy. From a cultural point of view, this way of doing history is the absolute antithesis of an academic culture, counterposed to it in mentality, intentionality, tone and language. In many cases local trade-union and municipal organisations have encouraged and supported these rank and file initiatives, which have been simultaneously a challenge, a warning, and a stimulus to the university-based historical establishments. We have seen various professional academic historians abandoning their isolation and getting involved with this kind of initiative; a number of factory councils have organised the gathering and recording of people's memories, and have encouraged companies to open their archives; we have also seen priests and pastors collaborating, in making available documents from Church archives. Many of these grass roots historians are teachers and social workers. Anyway, the point that I am making is this: in Germany there was the growth of a rank and file movement which, through to the mid-1980s, was able both to monitor and stimulate the research of professional university historians. This movement was able to add many pieces to the historical jigsaw of working-class life in the Weimar Republic and under Nazism. 6. The debate on "modernisation"
One of the problems which has animated historians in the past ten years has been the so-called "modernisation" debate. In other words, is it the case that, far from being a step back in history (as earlier interpretations have seen it) National Socialism was in fact a period of powerful innovation at all levels, not only in economic and technological terms, but also in social and industrial policy, in management of the media, etc. Needless to say, a question like this puts the cat among the pigeons, because if one sees the regime as having been innovative and modernising, one may end by having a more favourable view of it. The problem here is in the ambiguity of the terms "modern" and "modernity", and in the values which they are accorded among different historians, depending on their vision of the world and their idea of progress. This discussion concerns us here, because in the recent period it has focussed on the problem of social policy, in other words on the regime's intitiatives aimed at "integrating" the working class. Karl Heinz Roth's latest work to be published by our foundation completes the edited collection of documents of the Institute of the Science of Labour of the DAF (Deutsche Arbeitsfront, the Nazi trade union). In this work Roth gives a clear exposition of the various phases and positions represented in this debate, and he takes a position which is categorically opposed to the modernisation thesis. In Roth's opinion, the Nazis' measures and policies of control, repression and destruction of the working class are far more in evidence than measures and policies aimed at consensual integration. Naturally, this debate has not been limited to the history of the Nazi period; it has also extended back to the history of the Weimar period. One of the most original contributions has been that of a young historian who died recently - Detlev Peukert. He coined the phrase "the pathology of the Modern" to characterise the regressive aspects of Weimar and the Hitlerite regime. Peukert dealt with, among other things, the anti-Nazi resistance of German youth and of German militant workers. (His book The Social History of the Third Reich was published in Italian by Sansoni in 1989.) A number of his colleagues have since written articles in a volume in his memory, dealing with the problems arising from the concept of the "modern" and its use by historians: Zivilisation und Barbarei. Die widerspruchlichen Potentiale der Moderne. Detlev Peukert zum Gedenken, ed. F. Bajohr, W. Johe and U. Lohalm (1991). All these controversies, and the various levels of research that feed them, make it possible for us to set about finding an answer to the fundamental question that Mason's book had posed: why was it that the passive resistance to Nazism did not then translate into active resistance, into an open demonstration of antagonism, and why was there not a "sacrifice" of struggle against Nazism by the working class and the German proletariat, such as could be presented to the judgement of history as an element of its memory? Why was it that those sectors that did put up resistance were so thoroughly defeated? And how is it possible for historians from the "Left" area close to the Social Democratic party to write - as Gunter Mai did in an article published in the late 1980s - "The bourgeoisie brought Hitler to power; the working class kept him there"? Is it historical revisionism? Is it a polemical exaggeration? Is it a product of the tendency to devalue the role of the working class today? Is it an ideological stance? Or is it a logical consequence to be drawn from a reading of the documents? Is Mason now a thing of the past? Did he misread the documents? Is his distinction between "opposition" and "resistance" artificial? Or is it the case that, as the majority thesis would have it, the resistance was of such tiny, insignificant minorities as to reduce it to a peripheral and passing episode? I would like to attempt to answer these questions, on the basis of work that has been done by historians from Germany and other countries. I shall limit myself to two basic elements in the period covering the transition from the Weimar Republic to Nazism: the regime's administration of unemployment, and the physical confrontation with the Nazi gangs. Or rather, instead of providing answers, I shall attempt to provide a better framework for the questions, formulating them in different terms, and highlighting aspects of the history of the German proletariat which may be unfamiliar to the wider public. After that lengthy prologue, I now come to the main body of my contribution. I have divided it into three parts: 1) class composition and the structure of the workforce in the period of the Great Depression, before Hitler took power; 2) the organisation of self-defence and armed clashes between Nazi gangs and the German communist proletariat, taking the situation in Berlin as my example; 3) employment policies, the industrial lift-off, and the political behaviour of the working class in the early years of the Nazi regime. So, let us begin with the technical composition of the class. What was the working class at the end of the Weimar Republic? If we examine the statistics gathered by Heinrich A. Winkler in the third volume of his monumental work on the working class and labour movement in Weimar (Der Weg in die Katastrophe, Dietz Verlag 1990, 2nd edition) a few figures will suffice to define the situation: by the end of the Weimar Republic, the number of workers employed in factories with fewer than 10 employees stood at something like 7 million out of a total of 14.5 million - thus around 50 per cent of the workforce; in 1925 this had been 6,800,000 out of a total of 18.5 million, and thus a bare 34%. Thus when we speak of the working class of the final period of Weimar, we are talking of a working class that was already extremely atomised, which inhabited a factory environment that was fragmented and pulverised - as if they had been subjected to a decentralisation of production ante litteram. If the Weimar Republic was an extraordinary laboratory of modernity, it was partly on account of this form of production: instead of following the tendency of the times towards concentration and the big Fordist factory, it took an opposite path, in order to permit a better political and trade-union control of the workforce. In addition, we should remember the massive presence of self-employed workers, which rose from 15.9% of the workforce in 1925 to 16.4 in 1933, while the overall percentage of workers remained stable at 46%. According to Hachtmann, the author of a book on the industrial working class of the Third Reich (1989), self-employed workers represented 17.1% of workers employed in artisanal industry, and 25.1% of those employed in the transport-trade sector. Thus we are in the presence of a working class which was extremely fragmented and which was characterised by relatively unstable patterns of employment. The statistics on unemployment, classified by sector, feature at the head of the list, above engineering workers and workers in the metal trades, a strange figure of a worker, described as Lohnarbeiter wechselnder Art - in other words, a mobile waged worker, a worker who moved from one sector to another, from textiles to building, from engineering to transport, from agriculture to the service sector, without fixed employment in any particular sector. Historians have given scant attention to this, but the statisticians of the period were sophisticated researchers, with a deep understanding of the world of work, and aware of the marked segmentation of the labour market; they were struck by the appearance of this particular figure of manual worker (they were not necessarily unskilled workers; they could as well be skilled workers selling their labour here and there, at higher rates than they could have obtained by remaining in one particular workplace). The statisticians thus coined this term Lohnarbeiter wechselnder Art to describe this unstable, wandering mass. 900,000 of these mobile workers were unemployed in 1931; by 1933 the figure was 1,296,000. In Berlin, at the height of the Depression, they represented 45% of the unemployed, and in districts such as Kreuzberg, 48%. The problem posed by the statistics is the following: what grip was it possible for the political organisations of the labour movement, and in particular the Social Democrats, and the Catholic and Socialist trade unions, to have over a workforce that was so fragmented, dispersed and mobile? The main thrust of the Social Democratic union had concentrated on the component of the working class employed in the big factories, or in municipal workplaces, where trade union agreements were more or less respected. But this vast territory of the micro-factory, of micro-work, was a territory governed by unwritten rules and family-type relations of control. This level was characterised either by isolation, or by moments of cohesion that were at best informal. Historians have studied this field very little; what has stood in the way of historical research has been the old prejudice that the micro-enterprise consisted essentially of pre-capitalist artisanal undertakings, and that the artisans, the micro-entrepreneurs, belonged to the Mittelstand, to the middle classes, and were thus all reactionaries. The problem is that historiography is still carrying with it the prejudices of the historians of the Social Democratic labour movement, who considered as working class only the workers who worked in the big factories, and who have dedicated their research activities almost entirely to them. The result of this is that the province of artisanal undertakings was seen as the territory of the small-to-middle bourgeoisie, and therefore entirely reactionary and corporatist. This prejudice, based on an implicit concept of progress whereby only the big factory was capable of introducing processes of modernisation - by creating on the one hand a productive bourgeoisie and on the other trade-unionised workers, has literally blinded historians to the real nature of the processes of decentralisation of production, through which, very early on, capitalism - and the Weimar Republic is a real laboratory in this respect - moved to weaken the social cohesion and trade-union unity of the working class. The result of this prejudice is that historians have taken account only of the "little bosses" and not of their employees; thus historians have continued to see the artisanal concern as a pre-capitalist left-over, and not as the result of a decentralisation of the production of the big factory and a deliberate atomisation of the working class. If we want proof that here we are dealing with a "modern" phenomenon (or with a "pathology of the modern", as Peukert would have it), and not with some pre-capitalist remnant, we have it in the fact that after 1925, in the period of so-called "rationalisation", when Taylorist methods were being introduced massively into Germany, and when there was thus a process of modernisation of capital, the number of workers employed in micro-enterprises employing less than ten workers remained constant. I now turn to the question of the social base of the Communist Party, and I would begin with the phase of rationalisation, which began in 1924, when the worst of the inflation had been overcome by means of monetary reform, and particularly with help from the Americans. Productivity in the capital goods industry rose by 30% in the period 1925-29, and by 25% in the consumer goods sector. These were characterised as Weimar's "golden years": 1924-28. For some sections of the "new bourgeoisie" this was the case, but for the mass of workers it certainly was not. The average level of wages remained below that of 1913, and was only exceeded in a few categories. There was a strong degree of hierarchisation. In this period, not only did the condition of the working class fail to improve, but there also began a systematic and selective expulsion from the factories of the militant trade-union cadres of the Communist Party, and of the more combative among the Social-Democratic worker militants. The base of the Communist Party in the following period of the Great Depression, was characterised by considerable fluctuations in its membership, and by a large membership of young people; these two aspects were in part linked. In 1931, two years into the Depression, the German Communist Party was a party with a membership made up of 80% unemployed workers. At the party's organising conference in Berlin-Brandenburg, one of the Communist Party's strongholds, 878 of the 940 delegates present were unemployed. But the years of the Great Depression were also the years of an impressive electoral advance by the Communist Party. Electoral successes (or failures) are always to be measured against the "social power" of the party. We need to examine what strength the party might have had, given the social collocation of its members and supporters, in terms of influence over the mechanisms of power within civil society. Since it was made up principally of the unemployed, and thus mainly of ex-workers and young people in search of a first job, the Communist Party was not in a position to exercise any kind of trade-union power. It had to limit itself to trade-union propaganda, and to the hope that one or two of its militants still surviving in the workplaces might be able to act as the driving motors of particular conflicts. For a party that was still rooted in a "workerist" perspective, according to which the struggle against capital was to be won in the workplace, within the relations of production, this situation was profoundly disturbing. The Communist Party was obliged to shift onto "general" terrains, into mass campaigns that were as noisy as they were abstract, and the result of this was to over-emphasise the "propagandist", "cultural", "ideological" and basically electoralist side of its activity. This paradoxical situation, of a workers' party which had absolutely no trade-union power, was one of the reasons for the party's growing "ideologisation" at a time when the collectivity, as a result of the Great Depression, was having to push for things that were very material and concrete - the satisfaction of its most basic needs. But at the same time the condition of unemployment was a collective condition. The unemployed were not a marginal corner of society - they represented 30% of the population. The KPD was thus the strongest organisation of a new social stratum, that of the "long-term unemployed", which was a potentially explosive mix. This meant that the party had a social power and possibilities for mobilisation which were even greater when one remembers its popularity among the youth of the big cities. A few statistics will suffice to give an idea of the extent of the unemployment, and the dramatic nature of the situation in the years of the Great Depression, when both the Communist Party and the Nazi party were winning their biggest electoral successes. In the fourth quarter of 1930, the unemployed stood at 3,699,000; in the same period of 1931, the figure was 5,060,000; by one year later it stood at 5,353,000. The peak was reached when Hitler was already in power, in the first quarter of 1933, with 6,100,000 unemployed. But these are only the "official" unemployed, registered as such at government employment offices. Historians had been working on these figures up to about ten years ago. Then, thanks to work done by a woman researcher, Heidrun Homburg, attention was focused on statistics of the period which suggested the existence of a "hidden" stratum of unemployment. Homburg's work provided the basis for Winkler's reconstruction (for the post-1933 period, Rudiger Hachtman embarked on original research which, however, takes as its starting point the same contemporary works that Homburg had examined). The atomised structure of the workforce in the micro-enterprises, and the presence of a wandering mass of precarious workers, meant that there were very large numbers of people who had not worked sufficiently to get the right to unemployment benefit. In addition, as we shall see shortly, there were reasons that served to keep the unemployed away from Employment Offices. Thus if we also take into account the hidden unemployment, we arrive at the following figures: 4,115,000 unemployed in the fourth quarter of 1930, of which 32.5% were without unemployment benefit; 5,943,000 in 1931 (33.5% without benefit); 6,704,000 in the third quarter of 1932 (37.6% without benefit); and 7,781,000 in the first quarter of 1933 (31.6% without benefit). In short, if we add the "hidden" unemployment to the official statistics, we have to add between a million and a million and a half people to the figures. Unemployment on this scale produced such a strong fracture within technical class composition that it inevitably had consequences at the level of people's ideas, and thus of their political behaviours. The first fracture, obviously, was that between the employed and the unemployed, and therefore between a significant part of the base of the Social Democratic parties and the Communist rank and file; the second split occurred between unemployed people on benefit, unemployed people with forms of personal support, and unemployed people with no support whatever. The unemployment weakened the institution of the trade union in its functions of social control, whereby it creates a connective social fabric, a mediation between society's relatively guaranteed strata and its marginal strata. Both the parties within the labour movement, the SPD and the KPD, were deeply affected by the unemployment, which undermined their ability to exercise real power in society. The Communist Party tended increasingly to turn to propaganda activities, whereas the Social Democrats increasingly focussed their energies on local municipal administration, and on the administration of health and social security - in other words on that small amount of real power which enabled it to defend its members employed within public administration - and the management of public resources, given that trade-union activity in industrial workplaces had been effectively paralysed by the Depression. There was thus an enormous distance between the mentality of an average SPD cadre, who identified (and not just ideologically) with the bureaucracy of the Weimar Republic - and the mentality of the average KPD cadre. What the Communist Party had to offer its militants (the young, the unemployed, the rootless, the impoverished, the declassed) was the Utopia of the conquest of power - in other words the destruction of the Weimar state and the setting up of a Soviet-style republic. When people talk about "the two parties of the labour movement, the SPD and the KPD", they are perpetuating a mystification, a historical falsehood. But it is one into which it is easy to fall. The SPD and the KPD occupied such different positions, and the mentalities of their militants were so different, that it is hard to see them as members of one single "labour movement". These two political forces had been locked in bitter battle since the revolution of November 1918 and the events which followed it: the split between the workers led by the Social Democrats and those led by the Spartacists; the murder of Rosa Luxemburg and Karl Liebknecht; the split between the Social Democratic union and the KPD factory cells during the period of "rationalisation" (in this period the trade unions had attempted to set up structures for co-management, whereas the communist cells had declared outright war on the rationalisation and had been systematically rooted out of the factories, with their militants being sacked in a joint union-employer campaign). These were deep wounds, which, far from healing, became increasingly open. They were wounds within the body of the working class, and they aggravated the divisions already produced by the differences of social status (employed, unemployed, etc). It was not simply a question of two separate political lines, of different strategies of leaderships that were at loggerheads with each other; it was a question of two cultures, two different and hostile mentalities, so that "unity at the grassroots level", in other words the kind of unity that can be born out of everyday relations, on concrete issues, was just as difficult, if not more difficult, to create, as unity at the top. Erich Fromm, who was working at the celebrated Frankfurt Institute for Social Research run by Max Horkheimer, had the idea, in 1929, of organising a Workers' Inquiry, with the intention of examining the mentality and everyday opinions of ordinary working-class people, so as to identify possible inclinations towards authoritarianism; he applied a psycho-analytic methodology derived from family analysis. However his methods were not acceptable to the sociologists at the Institute. As a result of disagreements, the results of the Inquiry (which was terminated in 1931, on a very limited sample of around 700 questionnaires completed) were not published. Fromm and his collaborator, Hilde Weiss, the woman who actually did most of the work and must therefore be considered the true author of the Inquiry, were only finally able to publish their results in 1939, in exile in America. At the time it appeared that they had been reluctant to publish in 1931, because they were alarmed by the authoritarian streak which was revealed in the answers from their respondents, who were mostly militants of or sympathisers of the SPD. A reading of the replies to the questionnaires, which were republished in 1983, confirms this impression. Although the research sample was small, one can see a clear difference of mentality between the average SPD cadre and the KPD militant. One section of questions concerned issues of women's liberation, of women's dress and sexual behaviour, and another concerned questions of bringing up children. It is striking that the answers to these questions were more open and more detailed than those about rationalisation and conditions of work in the factories, on which there were about 50% "don't knows". Now, to return to the Communist Party, and to probe the source of its difficulties even at the moment of its greater electoral successes. The Party's potential power in society derived from the fact of its being the largest political organisation present within the mass of the unemployed. This meant that the institutional negotiating partner with which Communist Party members had to deal was the administration apparatus of the Ministry of Labour involved in the organisation of unemployment benefit - in other words, a complex and capillary apparatus which was one of the pillars of the Weimar state. The Communist Party had to prove itself in the organisation and leading of social conflicts not in the workplace, but in the arena of social welfare. If we wish to understand the crisis of the Weimar Republic and the transition to Nazism, it is clearly crucial that we understand the mechanisms of control, selection and disciplining which the welfare apparatus had at its disposal. The spiralling rise of unemployment gave this apparatus huge powers during the final phase of the Republic. We could go so far as to say that, in the eyes of the ordinary citizen, the only identifiable face of the state was that of the welfare apparatus. The discretional powers of this apparatus steadily increased, and at the same time its function as a "benefit agency" was gradually replaced by a function of "gathering information about people". The final Weimar governments, the two Bruning cabinets, the Von Papen cabinet and the Von Schleicher cabinet, were well aware of the controlling potential of the welfare apparatus. They used the lever of the system of Arbeitslosenversicherung - compulsory unemployment insurance - with great cynicism and to calculated effect in order to create a maximum of segmentation and atomisation within the mass of the unemployed. For example, young women without children lost the right to benefit, as did young people below the age of 21, and particular categories of workers (usually the weakest, and the most rebellious). The arguments used to justify the cuts and exclusions - which were always accompanied by some little "present" for other social groups, in order to accentuate the divisions - were always the same: the necessity of reducing the public spending deficit. Thus millions of the unemployed felt themselves constantly under threat even in an area of social right which they had acquired by means of contributions. Ordinary people, who were already desperate as a result of prolonged periods of unemployment, had the impression that the government was playing roulette with their poverty. Insecurity and exasperation grew, and there was a strong desire to get rid of the regime. But the atomisation of the unemployed prevented a social reconfiguration to the Left. The political Left did not exist; the SPD defended the Weimar regime as a democratic regime, as having been won by workers' victories; and the KPD wanted it to be abolished and replaced. The fact of these constant changes in the rules of social welfare contributed importantly to increasing the level of "hidden" unemployment; increasing numbers of people found themselves denied any form of social security, while others chose not to put themselves in a position of having to apply for moneys over which they would always have to argue. The system was organised around three forms of intervention. The first was the Arbeitslosenunterstutzung (ALU), the unemployment benefit made available under the 1927 law on compulsory unemployment insurance. This could be enjoyed only by those who had contributed for a certain period, in other words those who had been continuously employed over a period of years. The Krisenunterstutzung (KRU) was a benefit available for exceptional crisis situations in individual industrial districts or factories (along the lines of a special redundancy provision). This was available principally to those who had not accumulated sufficient contributions in order to obtain the ALU - in other words precarious workers, those who were unable to find a steady job, and who alternated periods of employment with periods of unemployment; this form of benefit was also introduced by the 1927 law. The third form of benefit was laid down in a law of 1924, and could be defined as a poor law; whereas the two previous benefits were administered and paid by the employment offices, and thus were part of a state insurance system, this third benefit was paid by individual municipal councils. The difference lay in the fact that those who did not have a sufficient period of steady employment to enjoy the rights laid down in the law of 1927 fell into this form of assistance. However, it was not a right acquired through an insurance system, but rather a gesture of solidarity of the municipal council and was based on discretional criteria. It was paid according to the individual circumstances of the person concerned, and the claimant was eventually expected to repay it. This was called the Wohlfartsunterstutzung (WU). The important point is the following: during the Depression, unemployment became a mass phenomenon and the periods involved grew longer and longer. Given that the system was conceived as operating at three levels, an increasing number of people who had the right to unemployment benefit ended up either losing their right, after prolonged periods of unemployment, or running out of time under the operating system laid down by the law. The result was that during the Depression an increasing number of people fell out of the first two levels and ended up in the third, with the result that local councils found themselves having to cope with a demand for funds which hadn't previously existed. Thus unemployed people were receiving less and less money. To phrase it differently, the unemployed were being turned into the assisted poor, and the judgement as to whether, and to what extent, they had the right to assistance was decided no longer by a ministerial bureaucracy but by a municipal bureaucracy which was in part unprepared, but which was also overwhelmed by the huge demands being made upon it. For the latter Weimar governments this situation was something of an advantage, given that it shifted the problem of social security assistance from state finances to local municipal finances. What did this mean for the unemployed, and particularly for the central core of the working class, which found itself driven into an assistential system which put them on the same level as the poorest and most marginal members of society? It meant that the workers became "the poor" not only in material terms but also in terms of the law. The relationship with a "social state" had been very important to social democracy and to the trade unions, in giving a sense of citizenship to the working class of the Weimar Republic and in this way inculcating a loyalty to the Republic's institutions. This bond was now being shattered, and the result was a further sense of alienation among the unemployed working class, in relation to the state and its institutions. Thus, when the working class is accused of not sufficiently defending the democratic Republic, one has to bear in mind that this democracy by now represented very little in the eyes of the central nucleus of the workforce. The result of driving the unemployed onto the system of municipal welfare was to create an army of people obliged to go asking for charity from a bureaucrat, who very often judged their needs solely on the basis of subjective impressions. The unemployed could receive social security only if they succeeded in convincing the benefits officer in a face-to-face interview. This led to the creation of a mass of millions of people who were open to blackmail. Furthermore - a fact which was important for the subsequent Nazi regime - the details of all these people were thoroughly documented. These circumstances perhaps explain why it was that, as the crisis progressed, increasingly large numbers of people chose not to take up any form of benefit, and thus added further to the numbers of those who were no longer registered as unemployed. This is the origin of the political, economic, social and statistical problem of the so-called "hidden unemployment" during the Great Depression. At the start of the crisis, the vast majority of the unemployed had the right to an unemployment benefit, the ALU referred to above. By March 1933, when Hitler was already in power and unemployment was reaching a peak, ALU recipients had become a minority. The vast majority ended up in the third pool: in other words, a situation was created in which millions of people were completely at the mercy of the municipal system of poverty assistance. To these we should add those who objected to the fact of being subjected to a highly discretional system, and of being monitored, and in addition of having to pay back their meagre benefits, and who ended up increasingly in the ranks of the "hidden unemployed". These represented, as I say, 32.5% of the total numbers on benefit in 1930, 37% in 1932, and 36.6% at the end of 1933 (we should bear in mind that this slight fall during 1933 was due to a reduction in unemployment thanks to the forced-employment systems introduced by Nazism, to which I shall return shortly). The result of all this was that during the years of the Depression, the weaker parts of the proletariat were either subjected to a system of monitoring and blackmail by the public social security authorities, or simply decided not to take up benefit, and thus found themselves deprived of any social or institutional reference point except that represented (for a minority) by the political organisations. Among these organisations, the two which exerted the greatest attraction for the mass of unemployed and rootless people were the National Socialist Party and the Communist Party, which, during that period, won the major electoral successes in both political and local elections. To repeat, in order to be absolutely clear: the determining factor was not simply the problem of unemployment; it was the way in which unemployment - and unemployment benefits - were managed for the unemployed and the poor. This system seems to have been created deliberately in order to bring about further atomisation within the proletariat (this is clearly suggested by recent research on the crisis years). 12. The "anti-social" strata: from the welfare office to the "Lager"
Recent research projects have shown how the social security system and the bureaucracy which administered it were consistently seen by the German proletariat as an adversary against which it had to stand its ground. The latest issue of the magazine Werkstattgeschichte carries a series of accounts by people telling the stories of their own personal tribulations as unemployed and poor people obliged to queue at social security offices in the 1920s. The accounts cover three successive periods: the Great Inflation (1923), the period following the great rationalisation (1924-28) and the period of the Great Depression (1929-33). In the memories of people who lived through those years, the relation with the welfare office is always conflictual. The effect of the crisis was to reduce to a state of poverty people who came from a variety of different social strata - clerks, shopkeepers and artisans, for example, who were expected to queue alongside old people, ex-prostitutes, single mothers with children, sailors without ships, unemployed factory workers, young couples devoid of means, and invalids. Once a day, once a week, or once a month, they had to go and convince the relevant authorities of the legitimacy of their requests, and had to repeat their personal stories with a mixture of humiliation and submission. Ever since the welfare system was first set up by law, the Communist Party had been agitating and mobilising among potential welfare applicants in order to get them to act collectively, to overcome the bureaucracy's attempts to divide them - not to go with a submissive attitude, but to go with the attitude of people demanding their lawful rights. Thus, partly as an effect of communist propaganda work, the behaviour of social security claimants became increasingly peremptory and aggressive, creating angry reactions from benefit officers and a rigidification of the structure. The same issue of the magazine records dozens of episodes of assaults, clashes, threats to benefits officers, and the police repeatedly being called. These scenes were an everyday reality in the Weimar Republic, particularly in the big cities. We should not forget that, despite the fact that they received subsidies from the state, and despite the fact that the broad outlines of criteria were fixed by the state, the municipal councils could only hand out benefits according to their financial capabilities; in small municipalities, which was where the majority of the German population lived, obviously the means available for social security were extremely limited. This meant that as regards the level of benefits, the qualification for benefit, and the form of benefit (which could be supplied partly in kind, or in return for work) there were enormous differences from zone to zone, and from municipality to municipality. Then there was the major problem represented by the very large numbers of migrant workers, travelling from one place to another in search of work; of necessity they found themselves requesting assistance not from the municipality of their own home towns, but from the town in which they were residing at the time. If this situation was already creating tension and unease in the period prior to the Great Depression, one can imagine what it must have produced with the onset of the crisis itself, and with the fact that, as we have seen, all of a sudden millions of people were expelled from the system of state unemployment insurance and put onto the municipal social security system. It was precisely at this point that the role of the social benefit system as a system of control and monitoring came to the fore. With the polarisation of the relationship between the administrative structure and the claimant in the course of the Depression, the structure progressively lost almost all its character as a social service, and became increasingly a supplementary policing system over the weaker parts of society. It became a system which increasingly divided and selected, creating further systems of degradation, but above all institutionalising social differences. This was the basic building-block of the Nazi system. One of the basic arguments of the research on marginalised sections of the population in the final period of the Weimar Republic concerns the role played by the welfare system. Our Foundation has done extremely important work on this area, around the history of municipal social security in Hamburg (the volume, edited by Angelika Ebbinghaus, was published in 1986 under the title Opfer und Taterinnen). What does this research reveal? It shows that the staff of the welfare bureaucracy, which was largely female, went over more or less without problems from the Social Democratic government to the Nazi government. The Nazis took over almost the entire personnel, and asked them to continue working as previously. In other words, to continue carrying out functions of monitoring, surveillance and classifying. In the meantime the Nazis were constructing a parallel structure of selecting out marginalised people on biological and racial grounds. The welfare structure, which included social hygiene personnel in addition to administrative staff, provided various kinds of information on individuals, on single "cases", to the authorities, who then intervened, in the sense of the segregation or physical annihilation of those individuals (internment in labour camps or in so-called psychiatric clinics, where they were subjected to forced sterilization and other "eugenic" operations). The majority of these people were considered suitable candidates for segregation and eventual annihilation because, for various reasons, they were defined as asozialen, in other words "anti-social". The reasons were many-fold: because they had been unemployed for too long; because they had committed small crimes against the common good; because they had been involved in prostitution; because they had illnesses that were considered hereditary; because they were seriously disabled; because their marital or sexual behaviour was irregular; because they had repeatedly assumed antagonistic protest attitudes in the workplace or against representatives of institutions (this was the case with the majority of Communist sympathisers); because they had changed their place of residence too often; or simply because they had been caught too many times on public transport without a ticket. Large numbers of the poor and the marginalised were thus defined as "anti-social" on the basis of information gathered by the welfare offices and amassed in their personal files, and they were then slotted into a machinery of selection which was not only a process of racial selection, but also a process of social selection. The majority of those interned in camps at the start of the Nazi regime consisted of these so-called "anti-social elements", who were subsequently to be termed gemeinschaftsfremde ("alien to the community"). Even by 1941 there were still 110,000 non-Jewish German prisoners in concentration camps, interned as asozialen. The politics of racial selection did not thus originate in anti-semitism; it originated not in ethnic concerns, but in order to handle the social question. The intention was physically to destroy the marginalised. This was what then led to the development of the so-called Nazi eugenics policies, or, as they were called, the "demographic policy" (Bevolkerungspolitik). The first Lagers, the first concentration camps, were the "labour houses" (Arbeitshauser) or hostels for the boarding of those who, in exchange for welfare benefit, were obliged to do compulsory labour. It is here that we must look for the origin of the Nazi concentration camp system. On the basis of the 1924 law which introduced social security for the poor, measures were also brought in to introduce forced labour. Now, when Hitler instituted his first measures of forced labour to reduce unemployment, he did it in terms of the law that had set up forced labour. The law of June 1933 (Gesetz zur Verminderung von Arbeitslosigkeit, the "Law for the Reduction of Unemployment"), one of the most important framing laws of Nazi labour policy, was framed explicitly in terms of the 1924 law on compulsory labour. This kind of labour is defined as a relationship does not give rise to a wage; it is part of a welfare service, and thus exists outside the framework of civil law governing labour relations; since the worker had no right to a wage, the services in kind which he received, in other words board and lodging, were conceived as a welfare provision, which came within the framework of administrative law. This was the nature of the juridical instruments by which the Hitler government brought about a reduction of unemployment over the next two years. The Nazi regime boasted of having absorbed, in the space of two years, something like eight million of the unemployed. However, we should not forget that about 70% of the jobs created by the Nazi regime's employment policies were part of the big programme of infrastructural public works (such as the Autobahn motorways). The workforce employed on these projects was defined within the juridical framework of compulsory labour (Pflichtarbeit). This was one reason for the growing discontent which spread among these workers, and which, in 1935-36, gave rise to what some have called a "cycle of strikes". The police authorities and the party organs registered 260 stoppages of work, most of which took place on motorway building sites or on building sites of other public works projects. The shortage of evidence as to which figures might have played a role as agitators, initiators and organisers of these stoppages suggests that the great majority of the workers who were active in these protests had already endured experiences, however brief, of imprisonment and internment in the camps. All the above, plus the fact that the great majority of workers were given jobs which were more or less forced labour, lend little credibility to the notion that the Nazi regime was an advanced example of Keynesianism in action. It would be more precise to say that the Nazi regime combined a number of formulae which we could call Keynesian (the financing of public works to create jobs) with welfare-type mechanisms inherited from the Weimar Republic, in addition to another absolutely integral factor - a system of coercion and repression within which the concentration camp functioned as a key component of labour policy. In short, the spending of public moneys to reduce unemployment could exist only within a labour policy environment in which not only were market variables suspended, and in which enormous areas of labour were regarded as falling outside of the rules of the civil code and were left in large part to the discretionality of the executive powers - in other words, labour that had become militarised. Thus the prevalent attitude of Nazism in relation to the working class was one that led not to its advancement and/or emancipation (as Zitelmann claims), but to its militarisation. I would like to touch on a problem which has been raised several times by historians. The question has been asked as to why the German working class did not rise up in violent demonstrations (barricades, general strikes, occupations of factories and railway stations etc) against Hitler in 1933. Why did it not put up a credible resistance in the preceding years? These questions come from a repertoire of false problems and mystifications which a certain brand of historian has concocted in order to deny the truth of the matter - in other words that a section of the German proletariat, particularly in the big urban and industrial centres, organised in part by the Comunist Party, but also developing autonomous forms of self-defence, tried by every means possible to counter the Nazis in the final years of the Weimar Republic, the time when Hitler's action squads and the trade-union initiatives of Nazi factory cells were becoming increasingly active and aggressive, and were conquering territory piece by piece. In an attempt to "defend" the German working class from the ignominious accusation of not having put up a resistance, some historians maintain that the proletariat who might have put up a local resistance to the Nazis were living a life so dire (given that they were almost entirely long-term unemployed) that, even though there was a subjective willingness to put up a fight, the hold of such a fight could at best have been brief and ephemeral. There may be a lot of truth in this interpretation (as we have seen above, with the operations of the social security system), but it still avoids the concrete question of how precisely they might have organised physical confrontation in the cities, in a situation in which (albeit characterised by strong elements of social destructuration produced by the crisis) proponents of political violence had to come to terms with a state structure that was very well equipped with the means necessary for the restoration of law and order. The problem is thus far more complex, because it has to do with research methodologies of a phenomenon that is entirely specific: namely so-called "political violence". Historians generally treat this problem almost exclusively from the viewpoint of ministries of the interior and police headquarters, not least because they rely almost exclusively on police records to study it. In fact the reality is rather more complex. It would be better to approach it from the subjective point of view of people who, in that period, were making the decision as to whether or not to fight the Nazi gangs in open confrontation. At this point I propose taking a small step backwards, to take a look at some of the basic historical conditions which created the situation in which the physical confrontations between proletarian and communist militants and Nazi activists developed. As we know, the Weimar Republic was governed in the period from the Great Inflation (1924) to the beginning of the Great Depression (1929) by centre-Left coalitions, in which the Social Democrats had a considerable presence, whereas in the years of the final crisis (1930-33) it was governed by centre-Right coalitions. In this later phase, Parliament was completely bypassed, since government was based on presidential and government decrees which tended to sidestep the formal mechanisms of parliamentary democracy. The Weimar Republic was a strange state system: more than half of its territory actually consisted of the Region of Prussia, within which - in the framework of the federalist constitution - there was a government which did not reflect the same relations of power as did the national parliament. Prussia was in fact governed by a majority of Social Democrats, who shared power with other parties but who in reality maintained control of both public administration and government. Berlin was part of Prussia, which meant that in the capital there was an overlap between the national government and the regional government, a system which finally went into crisis in 1931-32. Now, Prussia was governed not so much by the Social Democratic party as such, as by some of its more prestigious exponents. They had considerable power, and they were located on the extreme Right of the party. The key man in Prussia, for many years prime minister of the Prussian government, was Otto Braun, a man of open and declared authoritarian tendencies, who saw the role of social democracy as being in maintaining law and order, in the untouchability of the state bureaucray, and in a corporative partnership between trade unions and big capital. In the words of Theodor Eschenburg, the author of a fine book on the problem of "ungovernability" in the Weimar Republic, he was in favour of a "recallable dictatorship". Otto Braun's principal collaborator was for many years Albert Grzesinski, who was Minister of the Interior in Prussia, and from 1930 was also head of police in Berlin. We should not forget that during this period the Social Democrats had considerable powers in the area of law and order, because in 1928 one of their number, Carl Severing, was appointed Minister of the Interior of the Reich. The SPD took advantage of this to institute an extremely efficient reorganisation of the police, with the principal aim of setting up a special corps to prevent Bolshevik disturbances and uprisings. Unfortunately they were not equally efficient and motivated in preventing and repressing Nazi gangsterism. The situation inevitably aggravated the historic fracture between Social Democrats and Communists that had already existed since the murders of Rosa Luxemburg and Karl Liebknecht - a fracture which experienced a particularly acute moment - a point of "no return" - in the events of Mayday 1929. As you may know, in the Weimar Republic, Mayday was not a holiday. It was Hitler who declared Mayday a national Labour Day, in 1933. Thus the celebration of Mayday became a question of high moral value, and at the same time a problem of public order. On the one hand were the Communists, social revolutionaries and anarchists, who wanted to turn it into a day of struggle - an open, public proletarian festival, a challenge to capital and to the existing order. On the other stood the Social Democrats, wavering between a concern for legality and at the same time a need to make their role and presence felt on such a significant day. Mayday 1929 in Berlin fell in an atmosphere that was particularly tense, due partly to the onset of economic crisis and partly to the onset of a crisis of the political system. We should bear in mind that the big growth of National Socialism took place first in the South, i.e. in Bavaria, before then working its way up through the agricultural territory of Central-Eastern Germany, spreading north-eastwards into the old textile areas of Thuringia and Saxony on the one hand, while in the North-west it moved into the Catholic zones of Baden, Rhineland and Westfalia. The drive northwards seemed to follow a pincer movement targeting the red metropolises in the ports of the North, and especially in Berlin, which was a major working-class stronghold. At that time Berlin was a city with a powerful proletariat in industry (electrical engineering) and in the tertiary sector (transport and distribution), and this proletariat controlled entire local areas. When we speak of working-class quarters such as Neukoln and Treptow, just to give an idea of the size of them, we are talking of a population of 400,000 inhabitants. The battle for control of Berlin and its region was to last for three years, throughout all the upheavals of the Great Depression. The Nazis entrusted this task to able and freethinking individuals who represented the "far Left" of the party, people whose radical style of agitation tended to pull the carpet from under the feet not only of the Social Democratic trade unions, but also of the Communists. They pursued a "workerist" and trade-union propaganda, under the aegis of the "National Socialist factory cells" (NSBO), and they combined this with a systematic activity of terrorism via the use of militias and goon squads. The central figure of the Nazi Party in the battle for Berlin was, however, Josef Goebbels, the great specialist in the media and mass communications. Of the two radical leaders, Otto and Gregor Strasser, the first left the party in 1930, and the second was marginalised in the party shortly prior to Hitler's nomination as Chancellor. 14. Street fighters and "wilde Cliquen": Who did the fighting in the streets of Berlin? Throughout the period of the Weimar Republic, the terrain of politics was not confined to the dialectic between parties; it was, above all, direct, extra-parliamentary action, which often involved daily street and community confrontations pitting proletarians and militants to the left of the SPD, against police, militia and irregular military forces of the Right, who were increasingly joined by the massive and threatening presence of the National Socialist gangs. My intention is to look at this aspect of political struggle in a very specific time and place. The period is the last three years of the Weimar Republic, and the place is Berlin. These were the years of big electoral successes for both the Communists and the National Socialists. They were the years of the Great Depression, and for Hitler the conquest of Berlin represented something of a crucial battle. We have to answer the question as to whether the German proletariat did or did not put up resistance to the advancing forces of Nazism. From a reconstruction of the events of those three years in Berlin our reply is that there most certainly was resistance. It was also an armed resistance. The proletariat defended inch by inch the territory and the communities which, over decades of struggle, had become its strongholds. For details of this resistance I refer to research by an English historian, Eve Rosenhaft, published by Cambridge University Press in 1983, under the title Beating the Fascists? The German Communists and Political Violence 1929-1933. This is a detailed reconstruction of the military clashes between Communists and Nazis in Berlin. What was the developmental process of this physical confrontation, between the working-class milieu which at that time controlled entire quarters of the city and the activists of the National Socialist party? And what were the problems of tactics and technique - more political than military - in this street-by-street struggle? The paramilitary structure of the Communist Party was very strong, not least because, with its street politics, it was attracting the young unemployed, and the party was articulated in a number of organisations. The largest of these was the Kampfbund gegen den Faschismus, which at the end of 1931 reached a figure of 100,000 members, and which had more than 7,000 militants in Berlin alone. This is a very large membership for a political organisation which was dedicated essentially to militant action. Thus we have a highly complex and capillary structure of self defence promoted by the Communist Party, which extended beyond the communities which it controlled. This organisation and the specifically "military" slant of Communist political action acquired increasingly greater weight as the aggressive initiatives of the National Socialist gangs developed. This mechanism inevitably created contradictions, and brought about a crisis within the party's organisation in Berlin. I mention this problem of contradictions within the Communist Party now, because it is important that we bear in mind the enormous difficulties which a struggle at the level of physical and military confrontation posed for the German proletariat of that period. The first big difficulty was the material conditions of life and living-standards of the vast majority of those who were the direct protagonists of the struggle. The Communist grass roots consisted essentially of unemployed people, or of workers working in small factories and in those parts of the tertiary sector characterised by intermittent, precarious work. At the end of 1929, the party claimed 135,160 members, of whom 50% were working in factories; two years later, at the end of 1931, it had 381,000 members, of whom only 17% worked in factories. The district of Berlin-Brandenburg had about 30,000 members at the end of 1930, of whom 51% were unemployed, but at the district's organising conference in September 1931, 88 out of 96 delegates were unemployed. These unemployed belonged to the stratum of those who fell into the third level of the welfare system, the municipal social security system. They were the most open to blackmail, they were the most monitored, and often in order to escape state control they chose not to take up social security benefits. They were young and very young, often coming from broken families; they had never worked and had no prospects of finding work; they entered and left the party and its organisations extremely easily. People say that in some respects they were very similar to those of their peers who were joining the ranks of the National Socialist organisations. In fact, while it is true that the activists in both parties were characterised by being extremely young, nevertheless the parties' respective successes in recruiting took place in quite different contexts. We have the electoral researches of Falter and of various American historians to show that the Nazi vote was relatively low in the areas of high unemployment, and decidedly high in zones of low unemployment, whereas the Communist vote was markedly stronger in areas of high unemployment. However, while some generational and social characteristics of Communist and Nazi activists may have been similar, the conditions in which they lived and operated as militants involved in direct confrontation clashes were radically different: the finances available to Hitler's party enabled it to finance gangs, and to give them a minimal structure as an army of mercenaries; the Communist militants, however, were entirely voluntary, and could only draw on material assistance if they fell foul of the law (the Rote Hilfe or Red Aid was a powerful and well organised structure, although in the final years of Weimar it too was enmeshed in the travails of internal party crisis). The fact is that conditions for proletarian militants involved in the daily confrontations with the Nazis were extremely difficult, but despite this they fought with exceptional determination and self-sacrifice. However the crisis which exploded within the party in May 1932 had a devastating effect on this militant structure. This involved the marginalisation of Hans Neumann, who, together with two other leaders, Thalmann and Remmele, ran the party; also the removal of Albert Kuntz, the party's organising officer in Berlin, and two leaders of the Communist youth organisation, Alfred Hiller and Kurt Muller. This internal crisis was the outcome of a clash within the party which had become more acute since the electoral victory of 1930, and which was based on the relationship between individual violence and mass action. The fact that the party's electoral successes had given greater weight to the parliamentary fraction made it more difficult to strike a balance between legal and semi-legal forms of politics. This was the period during which, under pressure from the Comintern, the KPD was initiating a change of tactics. This involved condemning individual actions and trying to create a unity of rank and file action with militants and sympathisers of the SPD, and even trying to draw in some of the working-class base of the National Socialists. However the struggle was not extinguished; in fact the active militant defence of the "red areas" from Nazi incursions became a daily part of proletarian life, because many young proletarians - having left the Communist organisation after their leaders were removed and put in a minority, and after the tactic of the united front and mass action had gained the upper hand - had continued to maintain the self-defence structures, and to be involved in struggle. In the proletarian quarters of Berlin, right from the time of the Wilhelmian Reich, there had been a long tradition of profound hostility to the police. During the Weimar Republic, in some of the poorer quarters, the inhabitants preferred to organise vigilante squads against criminality rather than asking the police to intervene. Every time the police stepped in to arrest a person in these communities, they had to reckon on a possible negative reaction by the local population. The Communists - Walter Ulbricht played a central role in the organisation of their militant party structures in Berlin - in turn set up vigilante squads in the communities, and groups which defended particular groups of citizens, such as the anti-eviction groups (Mieterschutz). Finally, we should not forget that a large proportion of the young proletarians who chose to oppose physically the incursion of National Socialism belonged to no political organisation, or belonged only in a marginal sense, without any sense of party discipline. Detlev Peukert has done research on the youth gangs of Berlin (the so-called wilde Cliquen) at that time. These were not gangs in the traditional criminal sense of the term. Out of 600 youth gangs present in Berlin in 1930, only 10% had a relationship with organised crime, whereas around 70% were represented by the so-called "wandering bands" (Wandercliquen) which moved as groups, moving between the city and the hinterland, wearing white and green berets. One of their favourite pastimes was to embark on confrontations with the Hitlerjugend. In 1931 there were estimated to be 14,000 members of youth gangs, 50% of whom were considered apolitical, and only 15% defined as sympathising with the radical Left. I like to recall these circumstances, not least because one of the sponsors of our conference has been the Concetta Social Centre. It is worth remembering that among those who physically resisted the Hitlerite youth in that period, an important role was played by self-organised groupings of the young metropolitan proletariat, which had no connection with the various Communist organisations, but had more libertarian inclinations. Their attitudes were the attitudes characteristic of a youth culture founded on control of territory and on a strong group identity, in a period in which (these figures are from 1933, when Hitler came to power) 63% of young males below the age of 25 in Berlin were unemployed. Their behaviours are not comparable with those of the youth gangs of today in Los Angeles, or in South American cities, whether in the level of reciprocal violence, or in the level of arms used, or in general as regards the practice of violence. Eve Rosenhaft has tried to quantify by job-categories those who were fighting the Nazis in the streets (she calls them "the streetfighters"). On the basis of the figures gathered by the police, and those which came out in the course of trials, 43% were transport sector workers, 25% engineering workers, 8.7% building workers, 7% carpentry and furniture workers, 6.4% food workers, 2% printers and binders, 1.7% workers in the clothing sector, and 3% unspecified. In short, workers of the transport sector, involving port workers, sailors and railway workers, were a large percentage of those organising the resistance against Nazism and undertaking actions not only of propaganda, but also of sabotage. What was the tactic used by the Nazi party to penetrate the proletarian quarters? One of the most significant moments of the "Battle for Berlin" was the so-called campaign for the control of the Kneipen, in other words the city's street-corner pubs. Berlin's working-class quarters were inhabited principally by unemployed families (in some areas the level of unemployment was running at 75%). These unemployed had nowhere to go during the day, and they tended to gather in the taverns. The Kneipen have always had an important role in the history of the proletariat, as focal points for proletarian socialisation, and sometimes they had also functioned as meeting points and points of political exchange, a crossroad of circuits of information, places where actions and initiatives were organised. Unfortunately the taverns in the working-class areas in this period had a clientele that consumed little and was sometimes unable to pay even for what little it consumed. Landlords risked bankruptcy, and sometimes found themselves having to sell out to others who perhaps did not share their political sympathies, or who had not lived the same moments of struggle as some of their customers. The Nazis adopted a tactic of persuading pub owners that if they were to come over to their side, they could count on a secure income. In many instances, this tactic was successful, and the tavern in question would turn from a meeting-place of Communist sympathisers to a meeting-place for National Socialist activists. After a while, this systematic penetration by the Nazi gangs began to become worryingly widespread, and proletarian hostelries were beginning to operate as launchpads for terroristic activities carried out by Nazi mercenaries. The Communist Party therefore decided to initiate a campaign to regain control of some of these places. This was the so-called Kneipe-kampagne. The party embarked on a programme of systematic attacks on taverns that were now frequented by Nazis. The party's new line recommended that armed activity should always be undertaken within a framework of mass struggle, in order to avoid the risk of practising pure counter-terrorism. However, as we shall see from Eve Rosenhaft's reconstruction, the practice of mass struggle had been made extremely difficult by the material conditions in which the proletariat of that time found itself. The incident in question was particularly notorious. The SA had succeeded in buying out a tavern owner in one of the streets of Neukolln, a stronghold of the Left. "The house at 35 Richardstrasse was in many ways a model of society in Neukolln. It was one of the largest tenements in the area; built in 1905, with six courts, it contained 144 apartments. Four fifths of these were typical workers' quarters with kitchen, one living-room and shared toilet. They housed around five hundred people. These included about a dozen shopkeepers and master craftsmen, nine clerks, salesmen and domestics, two artists, twenty-one pensioners, and some ninety skilled and unskilled workers representing the major Berlin trades. Among the leaders of the tenants' movement against the SA were a printer, a pipe-fitter, a tailor, a metalworker, two construction workers, two unskilled labourers and a disabled veteran. The tavern on the ground floor front of the building had been bought in October 1929 by Heinrich Bowe, a contractor who had made a disastrous investment in his home town of Magdeburg and had decided to set up in business with the remains of his savings. It had been a centre for the activities first of a religious youth group and then, after the War, of clubs with left-wing political affiliations, and this continued after Bowe took over. As the Depression deepened, more and more of Bowe's guests were unable to find work; they continued to spend their days and evenings in the tavern, but the meagre allowance they received from the employment office and the welfare bureau did not permit them to go on eating, drinking and spending as they had in the past. When the SA offered to guarantee a minimum turnover of a barrel of beer a day if Bowe would put his premises at their disposal, the innkeeper saw the offer as the nearest way to avoid financial ruin. He consulted the local police commander, who assured him that there would be no serious danger involved, and accepted the SA's proposition. The clubs which had previously patronised the tavern promptly withdrew their custom, 'although Bowe would have been happy to keep some of them, especially the ones who used the bowling alleys'. Shortly thereafter, Bowe himself joined the NSDAP, 'for business reasons'. On 26 August, Sturm 21 of the Neukolln moved into Richardstrasse 35, and Bowe's expectations were fulfilled, with upwards of a hundred people gathering regularly in the assembly room at the back and some thirty hungry SA men appearing for lunch every day. The establishment of Sturm 21 in the Richardstrasse was thus very much like other SA takeovers of taverns during these months; like them, it reflected the growth of the Berlin SA, a development in which self-confidence ran before and fuelled a numerical expansion. The Nazis were outsiders only in the sense that they declared themselves to be so; the SA had a long history in Neukolln. An NSDAP cell had been operating there as early as 1926; and the leader of Sturm 21, a twenty-five-year-old salesman born and raised in Neukolln, had belonged to the party since its founding. By mid-1931 Neukolln had three SA Sturme and, according to the Communists' own intelligence, the NSDAP had 1,300 members and nine tavern-headquarters in the district at the end of August. Communists and SA-men had been getting to know each other for several years. On the Communists' side the SA was being identified and treated as a physical threat as early as October 1929, when the first SA group there already claimed seventy members; the SA leader dated the intensification of hostilities between the two groups from an incident during the election campaign of 1930. In 1931, the developing relationship between the two parties had already produced one change of allegiance, from SA to Kampfbund. In the course of the prosecutions following the attack on Bowe's tavern, a leading Communist activist joined the SA. That the SA was familiar in Neukolln did not, however, mean that it was welcome in the Richardstrasse. As Sturm 21 moved in, public attention was being focussed on the crimes of the Berlin SA by reports of the murder trial of members of Sturm 33, the notorious Charlottenburg squad. Given the character and history of the house, and the political sensitivity which had been growing in Neukolln with the National Socialist presence, tension was bound to arise between the tenants of the building and Bowe's new guests. Very soon after Sturm 21 took up residence, there were reports that the SA-men were urinating in hallways, waving their pistols at children playing in the courtyard, and threatening to shoot into people's windows. On 28 August the KPD functionary to whose cell Richardstrasse 35 belonged organised a tenants' meeting at which Communist speakers urged the calling of a rent strike. The proposal was adopted, and a few days later Die Rote Fahne reported success all along the line: three hundred extra copies of the paper had been sold, Social Democrats were showing interest, the house-defence squad already had sixty members, and the tenants had formed an action committee. The rent strike was set to begin on 1 September if the SA was not turned out. Goebbels, it was reported, had given orders that Richardstrasse 35 was not to be abandoned under any circumstances. In fact, the rent strike failed to materialise. In the weeks that followed, tensions increased as both the Communist and the National Socialist press focussed on the conflict. On 3 September Der Angriff, the National Socialist paper, claimed: 'In any case, things have gone so far that an SA-man doesn't dare venture into the Richardstrasse alone.' The Berlin central office of the KPD received reports from Neukolln that girls were no longer safe on the streets at night. Groups appeared in the courtyard behind Bowe's tavern chanting 'Schlagt die Faschisten' and 'Keep up the rent strike'. The windows of the assembly-room overlooking the court were smashed, and by the middle of October a special police patrol had been assigned to prevent people from gathering in front of the house. A group of KPD officers who visited the Richardstrasse one evening found the street completely deserted - an unusual scene in a working-class neighbourhood and a clearer sign than any amount of rowdiness that something was wrong. In the meantime, the rent strike had started again. On 29 September, the tenants met and resolved to begin the strike on 1 October. This time, the effort was better prepared and publicised. Vorwarts reported sympathetically, remarking that Reichsbanner men as well as Communists had already been attacked. Posters were printed announcing the strike, and mimeographed newsletters were issued. These explained that that strike had been postponed in the first place because the manager of the building had yielded to pressure and promised to evict the SA. The manager later denied that he had made any such promise; in any case, the SA stayed. Nor, the tenants claimed, had the police been of any assistance; according to the resolution of the tenants' meeting, police officers had been heard to declare that the house should be 'smoked out', since half the tenants were criminals anyway. All that was left for the beleaguered tenants was self-help; tenants who continued to pay their rent would be regarded as strike-breakers and allies of the troublemakers. A notary was named to whom rent payments could be made for the duration of the strike. In spite of the weeks of acrimony that lay behind it and the material and technical support which it received from the KPD in its execution, the October rent strike failed. It was impossible to mobilise a power which did not exist, and the tenants proved to be practically without power against their landlord. The threat of eviction, which the building manager raised at the first sign of action by the tenants, was a powerful deterrent in itself. What finally broke the back of the strike, however, was the fact that those tenants who were on welfare were not in a position to withhold their rent; the welfare bureau paid the rent directly to the manager. After two weeks of the strike, the manager claimed that eighty per cent of the rents had been paid, and a proposal was made formally to call off the action. The united response of Braunschweig's workers to the violence of the SA on 18 October inspired a burst of optimism strong enough to make the Communists reconsider. But the tenants' meeting at which those events were to be discussed, on 21 October, was the last that was heard of the strike. On the eighteenth, Bowe died of the wounds that he had received in the attack on his tavern; the tenants' meeting was broken up by the police and the thirty participants arrested." Thus far Eve Rosenhaft's reconstruction. The attack on Bowe's tavern was carried out on 15 October by about 30 demonstrators. They fired a number of shots at the premises, wounding customers and fatally wounding the owner. As we can see, the attempt to unify mass action and armed action failed, not least because the rent strike was rendered impossible by one of those lethal mechanisms of control characteristic of the municipal social security system described above. The majority of the tenants were on municipal social security; in this case the social security office anticipated payment of all or part of the rent, and transferred the amount directly into the landlord's account; even if they had wanted to, the tenants could not have gone on rent strike. The reprisal action was not difficult to organise and carry out, but the fact that it was not welded to mass action gave complete victory to the Nazis, because from that moment on they encountered no further resistance in that housing block, and for the group of tenants who had been most active in the attempted rent strike there opened a period of fear of being suspected or incriminated of complicity in the killing of the landlord. Of course this is only one episode, but it is illustrative of the kind of conditions in which German proletarians found themselves having to fight when they attempted to oppose the advance of the Nazis: repression by the Social Democratic police, the hunger and poverty caused by unemployment, the controlling mechanisms of the social security system, the contradictions and uncertainties of Communist Party policy, the lamentable shortage of equipment in the face of an adversary that was better equipped, better paid and better trained - all these elements illustrate even more the heroism and selflessness of those German proletarians who attempted to defend the territory of the "red areas" from the Nazi invaders. The general conclusion that can be drawn from these fragments of history is that it is not true that the German proletariat surrendered without a fight. The truth of the matter is that its capacities for resistance had been worn down during the terrible years of the Depression, when the Weimar Republic was governed with semi-dictatorial methods by those who opened the way for Hitler to come to power; the energies of those people who tried to resist him were stretched to the limits. 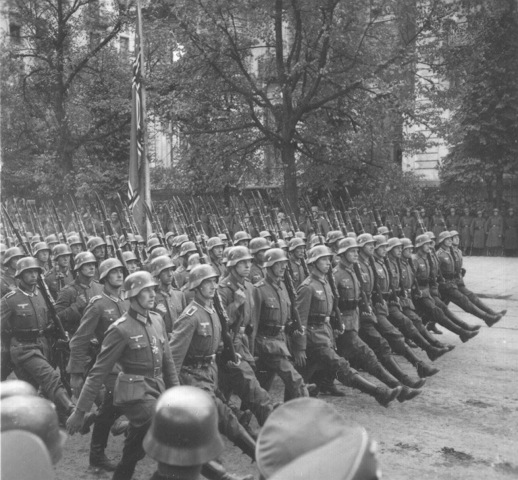 The years which preceded Hitler's seizure of power were years of creeping civil war. In the conditions in which the opponents of Nazism were obliged to conduct their resistance, it is hard to imagine how they could have done more or better. Therefore the judgement of historians who say that the German working class and proletariat submitted to Hitler without resistance is both unfair and incorrect, a travesty of reality, a view reflecting only the tendentiousness and ignorance of those who express it. Within this recognition of the moral and political strength of the resistance struggle of the German proletariat against Nazi terrorism, we should also remember that the Communist Party was the organisation which most determinedly and radically conducted the struggle against the advance of National Socialism, using all means possible, including the illegal. It would be reasonable to ask to what extent the culture and preparation of the party's so-called military cadres (party members who had been on courses in the Soviet Union training them for civil war, armed clandestinity and insurrection) was suitable for the political-military situation in which they found themselves, which was defined by illegal behaviours of the proletariat, and forms of control of metropolitan territory. This was not a pre-insurrectional conflict, or a battle for seizure of power, nor was it a campaign by a Red Army. An extremely important part must have been played by spontaneous forms of struggle and informal resistance, by non-party circuits of information, and by forms of youth aggregation - in short by that heritage of autonomy and antagonistic cultures which had been sedimented in the proletarian metropolis without its exponents needing to go through party training schools. In addition, we should remember that alongside the widespread culture of the Communist organisations there was a vast area influenced by social-revolutionary and anarcho-libertarian cultures. A sizeable section of the politicised proletariat was to be found in the anarcho-syndicalist Freie Arbeiter Union organisation, which at one point had 400,000 members, initially involving building workers and textile workers, and then spreading to involve engineering workers in small and medium factories and miners; this was a purely proletarian organisation, with no intellectuals or cadres coming from the petty and middle bourgeoisies. Compared with this overall section of the movement, which represented the active, daily,street by street resistance to Nazism, the actions and policies of the Social Democratic organisations were more inclined to demonstrating and less inclined to fighting. It is true that hundreds of individual cadres of the Social Democratic trade union and party were drawn by class solidarity to participate in various ways in actively resisting the invading Nazi squads. But our judgement on the behaviour of the Social Democratic party's leadership and apparatus (up until late 1932 they still consider that the prime danger for the so-called Weimar democracy was Bolshevism) has to be one of condemnation and contempt for their profound anti-proletarian sectarianism, their frightening political shortsightedness, and their deep cowardice in the face of Nazism. As for the actions of the Communist Party, I think one should say that, despite some wavering and many mistakes, the Communist Party fought determinedly to prevent the advance of National Socialism. However, in history books you too often find the thesis that the Nazis and Communists went side by side to fight against the institutions of Weimar, and you frequently find reference to the two episodes in which they found themselves in a united front against the Socialist Party: the public transport strike in Berlin in Autumn 1932, and the referendum against the Prussian government under Otto Braun; you almost never hear of the physical clashes which took place between proletarians organised by the KPD and the Nazi gangs. At this point I would also point to the central role played in Berlin during those years by Josef Goebbels' great adversary Walter Ulbricht. This is not meant to indicate approval for the role that Ulbricht went on to have subsequently as the head of the SED and the prime minister of East Germany. In fact it appears that once he reached power Ulbricht preferred to forget his heroic Weimarian exploits, because recalling the true events of that period might have jeopardised his relations with the Social Democrats and contradicted the legalitarian and gentlemanly image that post-war Communism was seeking to acquire. On 30 January 1933, Hitler became Chancellor. On 21 March, Nazi squads attacked various trade-union offices, in particular those of the ADGB trade union federation, which had reached a membership total of 8 million in 1921, but had then fallen to 4.5 million by the end of 1932 (in itself no mean figure). On that same day, 21 March 1933, Leipart, president of the ADGB, wrote to Hitler that "the trade unions are not intending to act directly on the terrain which pertains to state policy. Their task is rather to direct the just demands of workers in relation to the government's measures of social and economic policy." A few days later, Leipart again wrote to Hitler to inform him of the trade unions' complete dissociation from the Social Democratic party, and offering the government the collaboration of the trade unions. Meanwhile the Christian trade unions had declared themselves apolitical, and the trade union organisations of white collar workers (which were headed by the Christian trade union, and another of the centre Right) announced their submission to the regime. A few days later Hitler declared Mayday a national holiday, and the leadership of the ex-Socialist ADGB union federation invited its members to join the labour day celebrations. This was the signal for a complete capitulation. On 2 May, in an action that was coordinated throughout Germany, commandos of the SS and the SA occupied trade-union offices throughout the country, as well as the head offices of the "Bank of Workers, White Collar Workers and Functionaries" in Berlin, its branches throughout the Reich, and all offices of the trade-union press, without encountering any resistance. Leipart himself was arrested, along with all the leaders of the various individual trade unions, the directors of the workers' bank, all union officers above a certain level, and the editors of the trade-union press. Throughout the country, the actions of the Nazi commandos were carried through in a peaceful and disciplined fashion, almost as if there had been a tacit agreement between the aggressors and their victims. Incidents were few and far between. This was how the organisation which expressed the longest-standing tradition of the German working class capitulated shamefully to the violence of the dictatorship. All this happened exactly sixty years ago. The intention of today's meeting has been to recall some of the factors which made possible the victory of National Socialism and the defeat of the German working class and its organisations. Before I end, I would like to outline some of the circumstances which enabled the Nazi regime to consolidate its power, to soak up unemployment, and, in the final instance, to create a system for the disciplining and integration/consensus of the workforce. There have been many research studies of the labour policies of the first three years of the Nazi regime prior to the launch of the "Four Year Plan". Researchers have looked not only at the transformations of industrial labour, but also at the living conditions of the working class, at working-class attitudes and behaviours, at the National Socialist trade-union organisation, the Deutsche Arbeitsfront (DAF), at the structures of the factory trustees, at contractual proceedings, etc. In short, today we have large amounts of information to put alongside the material gathered by Tim Mason for the subsequent period (1937-39), and this material tends to confirm his basic theses. For the notes that follow, I shall use four basic sources: the work done by our Foundation on the DAF's Institute for Labour Science, and in particular a long essay on the social policies of the Nazi regime by Karl-Heinz Roth, which will be published in 1994; Rudiger Hachtmann's book Industriearbeit im Dritten Reich (1989) ("Industrial Labour in the Third Reich", subtitled "Research on labour conditions and wages in Germany from 1933 to 1945"); Matthias Frese's book, Betriebspolitik im Dritten Reich (1989), ("Company Policy in the Third Reich", subtitled "German Labour Front, employers and State bureaucracy in German industry, 1933-39"); and the book by Gunther Morsch, Arbeit und Brot (1993) ("Work and Bread", subtitled "Studies on the condition, mood, attitudes and behaviours of German workers, 1933-37"). I shall add figures taken from research on individual industries (for example, our Foundation's Daimler-Benz-Buch) and individual regions (for example, Bremen im Dritten Reich ("Bremen in the Third Reich") by Inge Marssolek and René Ott). If we want to understand the policies of the Hitler regime in relation to the working class, it is not enough to consider only the problem of unemployment and the policies pursued to absorb it. We also have to examine the measures taken against the employed working class. These measures manifested themselves not so much as employment policies, but rather as industrial policy initiatives, and thus were introduced with a close collaboration between the political/state apparatus and big capital. This would be a suitable point at which to open discussion of the class transformations on which we have thus far only touched. What we have here is a terrain of technological innovation and of major modifications in the organisation of labour (in particular of its skill structure). It is a terrain of restructuring with characteristics very different from those of the period 1924-28 (the phase of so-called "rationalisation" and the drastic job-cuts following the introduction of labour-saving machinery, reorganisation of the labour process etc). The figures that follow give a sense of the effects of the first big phase of restructuring, and give an idea of the class composition scenario at the moment when Hitler took power. From 1925 to 1929, increases in productivity in industry as a whole reached a figure of 25%; the figure was 30% in capital goods sectors. In 1925, factory workers represented 46% of the workforce, while in 1933 they were 46.3%. There was no big change in the balance between between the various occupational strata: public functionaries and military personnel still stood at 17%, while figures for the self-employed had risen by about half a percent and in 1933 stood at 16.4% of the workforce. In the overall period 1925-33, one of the more striking phenomena was the expulsion of women from the productive process (a 12% drop). In 1933, 25% of industrial workers were concentrated in the engineering and electrical engineering sectors. The food processing sector had 15%, textiles 13.1%, the building industry 12.5%, clothing 9.7%, wood 6.5%, minerals, 5.4%, brickworks 4.5%, chemicals 3.1%, press and publishing 2.3%, paper 2.1% and water, gas and electricity services 1.9%. In fact the importance of the engineering and electrical engineering sector within the workforce as a whole was much greater than appears from these figures, because in 1933 the sector had a potential workforce of 3,068,500 people, of whom only 1,862,600 were in employment - in other words the sector had 1,194,100 people unemployed); if we use this technique of adding both employed and unemployed within a sector, we find the building industry in second place, with an active population of 2,002,800, of whom only 1,105,600 were in employment. These figures, albeit rough, show that the central nucleus of the German factory working class at the moment that Hitler took power was concentrated in the engineering and electrical engineering sectors. Therefore, if the Nazi state wanted to pursue policies aimed at moulding the working class to its ends it was going to have to intervene with industrial policy measures in the engineering and electrical engineering sector. The working class of the building industry, as we know, has very different characteristics to the factory working class. The textile and clothing sectors, for their part, were characterised by a majority presence of women in the workforce: 56.4% in textiles in 1933, and 68.2% in clothing. Roughly speaking the geographic distribution of the factory system in Germany was as follows: the textile and clothing industry had a large concentration in Saxony and neighbouring regions, with a level of women's employment higher than the national average, touching on 70%. The coastal region embracing the big ports of the North (Hamburg, Bremen and Kiel), and the areas of Berlin, Lower Saxony, Central and Southern Germany, had the big car factories, and the factories for shipbuilding, machinery, electrical plant, light and heavy engineering. Heavy industry, coalmining and steel industry were concentrated in the Ruhr and the big industrial basin of Westfalia and the Rhineland. Broadly speaking these were the three blocs of the factory working class which Hitler was going to have to integrate into his totalitarian state. These were also the most refractory sections of the factory working class, the part with the longest Socialist and Communist traditions, and with the strongest trade-union background. If we examine the industrial policy initiatives of the period, and the course of restructuration and major technological innovation, certain things become apparent. The industrial territories characterised by a large number of women workers (which in the employers' eyes presented a less urgent and serious problem of discipline) were left largely on the margins of the processes of innovation and restructuring. The textile and clothing industries were left in a limbo of stagnation, which saw neither major traumas nor major transformations. The most significant interventions were in the engineering sector, and thus in the construction of means of transport and machinery. Why did women seem to represent the more docile component of the working class? Already during the Weimar Republic, women workers were discriminated against and kept in a position of subordination. Their wages were 30-40% lower than those of men for similar jobs, and in the auto industry their piecework earnings were less than half those of the men. A large part of the female working population had been excluded from the system of compulsory insurance. The decrees of the final Weimar governments introduced new regulations aimed at excluding certain strata of the population from social state benefits, and these had hit women particularly hard, especially young single women. During the Great Depression women's social condition worsened still further, because a public opinion campaign was launched against married women who worked; they were accused of taking work away from men, and of enjoying a double wage, their own and that of their husbands. When it came to layoffs, women were often the ones who suffered first. Now, this is not the point to enter on a specific discussion of National Socialist state policy regarding women, although this topic has, in the past 20 years, seen some of the very best historiographical research on the Nazi period. Suffice to say that in its employment policies the Hitlerite state did not promote women's work - or rather it promoted the image of the housewife dedicated entirely to her husband and to reproduction. This does not mean that, in situations where women's employment was high, women were replaced by men; while in general the Hitlerian woman is seen as a breeder of pure-race exemplars, women's employment in industrial labour did not fall much in the years which preceded the Second World War (in percentage terms it went from 29.3% of industrial employment in 1933 to 25.2% in 1938). However, in absolute terms the number of women employed in industry rose from 1,205,000 in 1933 to 1,549,000 in 1936. And in a number of decisive sectors such as engineering (but not auto) and electrical engineering, women's employment rose; it went, respectively, from 40.1% in 1933 to 41.6% in 1938, and from 37% in 1933 to 38.8% in 1938. In the textile districts of Saxony, where 70% of the workforce was female, throughout the period preceding the War there were substantial layoffs and many sackings, because the textile industry was short of raw material as a result of the Nazi policy of autarchy. Thus textile wages, including those of the most skilled male workers, were five times lower than those of skilled workers in the auto industry. This meant that the textile districts of Saxony, Thuringia and the Rhineland were regions of great poverty during the whole period prior to World War II, and workers were encouraged to transfer to other industrial regions, where from 1936-36 onwards, key sectors of industry were experiencing shortages of skilled labour. The regime was able to exploit these sectoral and regional imbalances to ensure the discipline of the working class. What was happening in the highly industrialised areas was radically different from the situation in the textile districts, and was characterised by expanding sectors and technological innovation. However, before going on to cite examples from the auto and aeronautical industries, I want to look at an important fact of Germany's class composition at the moment when Hitler came to power, to which which I referred earlier. Namely the dramatic fragmentation of the working class, a fragmentation which had grown throughout the Weimar period. In fact in 1925, 30.4% of workers were employed in establishments with fewer than 200 employees, and 22.7% in establishments with a maximum of 3 employees. This too is an important fact for understanding why, once Hitler reached power, he encountered no great difficulties in disciplining and integrating the working class. As I said above, unfortunately historians have not analysed the characteristics of the micro-firms of that period; thus we do not know the nature of the technical and economic relations that existed between this enormous territory of the micro-firm (totalling about 96.3% of all firms) and the big companies. For example, was it a relationship more or less analogous to what we have today in the so-called "network company"? This lack of analysis makes it hard to understand the relations that would have existed between workers employed in micro-firms and workers employed in big companies of that period. However, the industrial policies of the Nazi regime tended to favour a powerful drive towards concentration; the individual activities of self-employed workers and artisans were discouraged by means of specific decrees; employment in large factories was encouraged, and here - as we shall see shortly in the statistics on working hours - exploitation was more intense and discipline better guaranteed. The extension of weekly working hours was one of the more striking phenomena of Nazi industrial policy. If we leave aside the textile districts, where the stagnation produced by the policy of autarchy had led to working weeks of between 14 and 36 hours, in the rest of industry and in particular in the key sectors, from 1934-35 onwards, there was a tendency to extend working hours well beyond the 8-hour day. There was a crisis in the labour market due to the fact that in the latter years of Weimar apprenticeships and professional training had fallen into decline, and this meant that workers in the more specialised jobs were working an average of 12-16 hour a day. A decree of 26 July 1934 authorised working hours in the building industry and the service sector to be extended to 60 hours per week. This law opened the way for a general increase in working hours throughout industry, in some cases provoking excesses against which even the Nazi authorities themselves had to intervene. Inspections carried out in engineering factories in 1935-36 discovered that it was not unusual for workers to be working between 80 and 110 hours, in other words doing between 30 and 40 hours overtime per week. This increase in working hours was combined with an extension of forms of payment geared to output - wage forms which permitted, among other things, considerable diffentiations of treatment within various categories of workers. The regime's labour policies, if we leave aside for the moment occupational measures, were such as to encourage the employers and management in industry to practise an intensive exploitation of the workforce of a kind that had perhaps never previously been seen in the history of the German working class. If the workers initially submitted to these conditions, this was for two main reasons: most workers had come from a recent bad experience of unemployment, and since wage levels were very low the only way to ensure an income and a decent standard of living was to do a lot of overtime and accept the rigours of piecework. But these are also the premises for an attitude of greater resistance, of rejection of exploitation, and even of sabotage, as Tim Mason has documented - behaviours which began to be seen in the later period, when the war economy began to get into its stride. In his research on the Italians who went to work in German factories post-1938, Cesare Bermani has collected personal accounts which suggest that German workers proposed to Italians that they work more slowly. We should perhaps remember that, while during the Nazi period Taylorisation was massively introduced into the majority of German factories, the work was not so much organised on assembly lines with automatic conveyors, but, as Hachtmann observes, was more based on "islands" of production, with individual and small-team piecework. There were visible symptoms of a greater autonomy of the working class (or at least of some groups) at the moment when, once full employment had been established, and with the beginning of a boom based on massive state orders in the field of war production, the working class realised that it had a certain power. This power derived particularly from the fact that companies were complaining about shortages of skilled workers, and were thus disposed to improve terms and conditions of employment in order to attract labour. Thus this period saw an increase in mobility of labour from factory to factory, sector to sector and region to region. Mobility figures for the motor industry fluctuate between 17% and 20%, and are indicative of the scale of the problem. Since many workers with Social Democratic or Communist sympathies in the Weimar Republic had been skilled or qualified workers, companies were rather inclined to turn a blind eye to their political pasts, for the sake of attracting skilled labour. There are documents of the DAF and the Gestapo indicating a note of alarm at this attitude of the employers. However, in the course of 1936-37 we find an identifiable cycle of strikes, a kind of "moment of insubordination", which was precisely recorded in a document of the DAF (published in its entirety in No. 4/1991 of our journal 1999) which reported more than 200 work stoppages in the period from January 1936 to July 1937. Very few of these actions took place in large factories (exceptions were at Opel in Russelsheim, where on 25 June 1936 236 workers in the Body Plant went on strike; Auto Union in Berlin, where 600 trim workers went on strike; and in the shipyards at Bremen, where a Communist organiser, Ernst Novak, was arrested and tortured to death). The other labour agitations took place mostly in motorway building sites, in small and medium-size factories, and in the textile districts where hunger ruled. The regime's repressive apparatus went into action. 11,687 people were arrested. There were 609 trials, 3,238 sentences comprising a total of 8,294 years in prison; 898 of those sentenced were reportedly members of the Communist Party, 730 members of the ADGB, and 473 of the SPD. With bureaucratic precision, the DAF subdivided these labour disputes according to their causes: 21% were attributed to "Marxist agitation", 14% to "general instigation", 15% to "social unrest", 25% to "wage questions", and 22% to "other reasons". The most thorough-going research on this "cycle of struggles" has been that of Morsch, who gives it a hundred pages in his book Arbeit und Brot. Another crucial factor in the transformation of class composition was the state support given to the technologically advanced and innovative sectors, for example aeronautics. To give a few brief figures for the development of the aero industry in Bremen (taken from an essay by Dieter Pfliegensdorfer published 1988 in the first issue of our journal 1999), the Focke-Wolf company went from 300 employees in 1933 to 32,500 in 1944; and Weser Flugzeug Bau went from 410 employees in 1934 to 28,000 by 1944. The other nerve points of the German aero industry were at Rostock (Heinkel), Dessau (Junkers), and Bodensee in Bavaria (Dornier). In Bremen there was a very particular problem of local political class composition that needed to be addressed. The central core of the working class consisted of highly politicised shipyard workers, among whom Communists and Social Democrats had maintained a solid base during the period of the Weimar Republic. The shipyards had been hit badly by crisis during the Weimar years, and a lot of local capital, in conjunction with capital coming from the maritime-commercial sector, had been looking for new investment opportunities in the aeronautical industry. Thus it was the shipyard employers themselves who were to create the new industry, with the result also of creating a new type of working class. As it turned out, recruitment into the industry did not draw so much on the freely available ex-shipyard workers, but more on skilled workers from the small engineering industries. The projects of large-scale aircraft production and the constitution of a new working-class elite met with enthusiastic approval from the Nazi regime, which saw this as the realisation of one of its principal objectives. Driven by generous state orders, the Bremen aero industry underwent considerable expansion. Weser Flugzeug Bau was building under licence, whereas Focke-Wolf created its own models. The Focke-Wolf factory had a workforce which was very highly skilled, and which manifested esprit de corps and pride in the factory. It had a legendary managing director, an engineer by name of Tank, who himself did the test flights for the new models, much to the approval of his staff. Fokke-Wolf invested a lot in research and experimentation in helicopter technology; its aircraft won competitions all round the world. Its personnel policies had two faces: on the one hand, a generous social policy (the building of homes for employees, intensive touristic and cultural activities, a very pleasant working environment, a spacious 1,000-seat canteen which could also be used for social events and political indoctrination, and free access to the Roselius library, with its 11,000 volumes; on the other hand, a system ruthless militarisation (identity cards, strict surveillance, the presence of the Gestapo in the workplace in addition to the normal factory police, with the pretext of protecting industrial-military secrecy). In 1937, to accentuate the elite character of the factory, but also its military vocation, a school was opened for aeronautical-mechanical pupils, which was accessible only to those who belonged to a special section of the Hitler Youth. Shortly afterwards, the Fliegertechnische Vorschule was created, where the future technicians of the Luftwaffe's ground staff received training in advanced mechanics; these pupils lived in barracks close to the factory, and were under military discipline. The accounts collected by contemporary historians among workers who had lived the Nazi period agree in stressing the excellent atmosphere in the factory, and the extent of collaboration with fellow workers; however, it took only a minor infraction, a lateness, an unjustified absence or an angry word for a worker to end up in a concentration camp; thus it sometimes happened that one's workmates would disappear for months at a time, with no explanation offered, and when they returned they were obliged to maintain silence as to where they had been. This systematic operation of integration and militarisation did not, however, prevent pacifist leaflets appearing in the factory when war broke out, as well as refusals of overtime, and absenteeism reaching a level of 10%. Another important aspect of the policies tending towards the integration of the working class (which has been analysed in particular by the literature on women) is that regarding the integrative social provisions provided by individual companies. These were so extensive as to constitute a parallel system to the state system. This integrative "welfare" system was particularly attentive to the problems of women workers with children; company policy with regard to women in the factory was expected to make provision for their role as mothers of the Aryan race. Thus the overall social and industrial policies pursued by the Nazi regime can be seen as highly complex, inasmuch as they intervened selectively and in a differentiated manner on various individual components of the workforce. The result was the phenomenon that historians of the working class under Nazism have consistently highlighted: adaptation and submission, participation and alienation, atomisation and an enforced withdrawal into private space, at the same time as public space is invaded and pervaded by the mass apparatus of the regime, an apparatus which was not merely propagandistic, but which actually did offer an alternative society. So we can say that the integration was not a general integration, but an integration aimed at particular new sectors. Horkheimer, the former director of the Institut fur Sozialforschung in Frankfurt, used to say: "If you don't want to talk about capitalism, then don't talk about Nazism." However, in recent times the relationship between Nazism and capitalism has become increasingly the subject of a debate which, in some respects, is full of misunderstandings and is of no particular use: the debate on the so-called "modernisation" to which I referred earlier. Unfortunately to enter into this debate would take us beyond the terms that we have set ourselves with this initiative. Our principal aim has been to commemorate the sixtieth anniversary of Hitler's rise to power, to reconstruct the basic stages of his advance to power, and to examine his policies as they affected the working class. We have examined the nature of that social territory which we call the "working class" during the period of the Great Depression, and we have recalled how a section of the German proletariat reacted to, and fought determinedly against, the rise of National Socialism. We have had to leave out of account certain important aspects of the period, as for example the activities of the National Socialist factory cells. These played a decisive role, particularly in the years of the "Battle for Berlin", where they had important successes in the workplaces; the Nazis' factory cell organisation, the NSBO, reinforced the "extremist" and social-revolutionary wing of the Hitlerian movement, headed by the Strasser brothers; after the Nazis' taking of power, it was progressively marginalised, in part integrated into the DAF trade union apparatus, and in part brutally liquidated in the course of the various purges which took place from 1934 onwards. However, if we organise any similar events in the future, we would expect to return to these developments. We would be interested to analyse the Nazi regime's industrial and social policies with more precision, in its three major phases: the phase of reduction of unemployment (1933-36), that of the Four Year Plan (from 1937 onwards) and that of the massive importation of foreign labour-power, to which the Nazis added the ever-growing army of prisoners of war and deportees, with a view to constructing a kind of forced-labour apparatus never before seen in modern industrial society. When we approach the question of relations between National Socialism and capital, or more particularly between the Nazi state and big capital, we should not overlook the contribution made by the historiography of the ex-German Democratic Republic, both as regards the theoretical definition of these relations (characterised by schemas that are typical of the culture of Socialist countries), and as regards the empirical research, which is extremely rich, and which has produced results of considerable value (for example Dietrich Eicholz's research on the war economy). After the fall of the Berlin Wall, the entire scientific and apparatus of the ex-GDR was hit by a wave of purges and sackings, in the course of which the academic community of West Germany unfortunately demonstrated a cowardliness and spirit of revenge unworthy of a civilised country. Some historical research institutes that had won a worldwide respect, such as the Institut fur Wirtschaftsgeschichte of the ex-Academy of Sciences of East Berlin, founded by Jurgen Kuczynski - the great historian of working-class conditions - and the "Institute for the History of the Labour Movement" were abolished; others, such as the Institute of History at the Humboldt University in Berlin, underwent major staff changes. The journal of our Foundation has been the only journalistic publication to document precisely and in detail this operation of purging and dismantling of the history departments of the ex-German Republic. The historians and researchers of the ex-GDR have reacted to this operation in several ways: some have given in, but others, such as Manfred Kossok, ex-Vice-rector of the University of Leipzig and director of the Institut fur Universal- und Kulturgeschichte (formerly under the directorship of Markow) stood up against the offensive. (Kossok, whom I had the pleasure of meeting last summer in Leipzig, died in February of this year.) Others launched a process of critical rethinking of the experience of the ex-GDR's historiography of Fascism (on this, see the interesting volume of essays entitled Faschismus und Rassismus, edited by Werner Rohr, published by Akademie Verlag, Berlin 1992). This group of historians, which includes Dietrich Eicholz, set up in Berlin the Berliner Gesellschaft fur Faschismus- und Weltkriegsvorschung, to continue both the research work and the advancement of theoretical-methodological thinking on the Nazi phenomenon. This initiative has gone hand in hand with initiatives in West Berlin, such as the Berliner Forum fur Geschichte und Gegenwart, an organisation which intends to coordinate initatives with the Geschichtswerkstatten. These few indications should suffice to show that there exists a broad array of people who are not inclined to surrender to the ruling mood of revisionism in Germany. Incidentally, we should not forget the journal of our own Foundation, 1999. Zeitschrift fur Sozialgeschichte des 20. und 21. Jahrhunderts, which has a readership of 3,000 and more than a thousand subscribers - way ahead of any other similar journal. Thus there may be many shadows in German cultural life, many opportunistic and academic capitulations among historians, a worrying growth of the neo-Nazi phenomenon, and an attempt to cancel out the memory of the GDR, but at the same time there are many militant democratic forces at work. However, it should be said that even the most committed historiography has for many years been unable to create new, richer, more complex and articulated interpretative schemas than those which were laid down in the 1960s and 1970s. The problematics seem substantially to have remained the same, and the research work has gone forward on a kind of plateau. What we lack is the creation of new historical paradigms and new interpretative perspectives, and this has sometimes been a source of weakness in otherwise impressive and accurate research projects. It has left us disadvantaged in the face of the superficial pamphleteering of revisionist historiography, which may lack in documentational evidence, but which has a devastating subversive energy, and is capable of proposing new syntheses and new "myths". This subversive energy is given plausibility by the media, who treat the revisionist theses as "scoops", and it is not neutralised by "serious" research, because it has a different form from that of traditional "historical discourse". This revisionism is not dangerous so much for the things that it says, as for the ways in which it says them; it has created a diferent kind of historical discourse, dislocating completely the terrain of cultural comparison, and bypassing research on documents and sources. In order to confront confront this revisionism, it is crucial that we take account of this change in the status of historical discourse. At this point it would be worth asking how Italian historiography, particularly that of the self-styled "Left", compares to the more impressive German and Anglo-Saxon research on the Nazi period. In the preparations for this conference, Pier Paolo Poggio examined the principal history journals being published in Italy today (including Rivista di storia contemporanea, Passato e presente, Studi storici, etc). Going back over the past 15 years, he found only one article dealing with the relationship between Nazism and the working class in the 1930s. Needless to say, it was an article by Tim Mason, published posthumously by Gustavo Corni in a Trento journal. For the rest, the only indication in an Italian research context of the progress made in this field by German historiography has been the occasional comment from Enzo Collotti. Nor does the issue seem to have sparked much interest on the cultural pages of L'Unita or Il Manifesto. Since there is no doubt that there are specialists who know this literature well, one can only presume that they have not thought it worthwhile publicising its results. Thus, what the public knows about the history of Nazism is what it is handed from the colour supplements, where vulgar journalism pours forth rivers of banalities and commonplaces on the occasion of historical anniversaries, or from the works of revisionist historians, eagerly translated by our publishing houses and then popularised on TV chat-shows. Our meeting today has been an attempt to resist this trend, since we believe that this dramatic page of history should not be reserved for specialists. It is so full of meaning and warnings that it should be a basic axis of the political-historical culture of each and every one of us. In the absence of this, it is hard to see how one can have a sure sense of democracy. It is, thus, a story which has to be told in a language which is clear, simple and accessible - told with all the passions of great civil and political struggles. Hello. Thanks for the great article, and wonderful website devoted to political and social histories related to work. What I take away from your article is the importance of recognizing the existence of resistance by the working class to Nazism. But I don't think this should minimize the existnece of partiicpaton by the working classes as well. i am doing research on my grandmother who, according to family lore, had shown Nazi sympathies in the 1930s. According to my research, she immigrated to nyc from Bremerhaven in 1927 as a housecleaner from a lower middle class family (she had no schooling; but she was literate; and her brother was training to be an engineer). In 1932 she married another german immigrant (her first husband, not my grandfather)- an illiterate young man who worked at the "Jewish Hospital for the Aged" as a porter, and who had wanted to take her back with him to Germany. In sum, I believe he was full of class resentment and Hitler manipulated and exploited this,. It makes me wonder how explicit Hitler was in addressing and promising a better life to working class. I think we can acknowledge elements of resistance as well as participation. I think it is valuable to do so- the working classes have certain vulnerabilities (including limited education, especially as it relates to extensive and stressful working lives) and these can be manipulated. We are seeing this again in the era of Trump. Interested in any feedback you may have. Next time some student Trot parrots their standard line of how it was the KPD's fault that Hitler came to power because they refused to cooperate with the SPD mention this incident to them. Few Anglophone radicals have ever heard of this massacre, I hadn't until I read this article, but a United Front between organisations one of whom orders a police massacre of the other seems rather unlikely. @bastarx Do you have a link for that one? 'working class support' for Trump has been overplayed by many liberal commentators. Turnout for the election was significantly down on previous elections, so it's not the case that lots of working class people suddenly turned out to vote for Trump, but equally or moreso that a lot of working class people did not turn out to vote for either party. A lot of Trump support comes from small business owners and management layers (let alone large business owners). There was a swing in support, but the huge focus on the 'white working class' both with Trump and Brexit has been partly about blaming poor people for the result and partly politicians and pundits trying to justify their own support for racist policies out of some kind of concern. If you mean the long quote in the post, it's from the very article we're commenting on.